Lots of cities have passes whereby you pay a fixed amount to gain entry to a number of attractions in that city. Most of the time, I don’t think that they are worth the money but of course, there are some gems if you look hard enough! 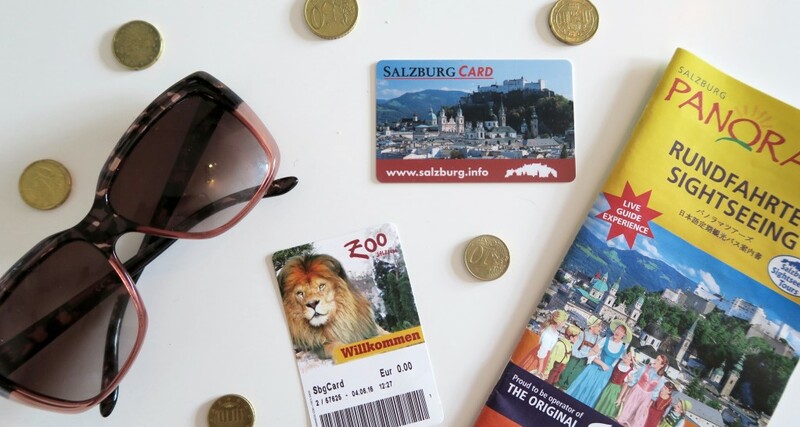 When I visited Salzburg in 2016, we purchased “The Salzburg Card” and I was very impressed with the value for money – you can read my full breakdown of the costs here. 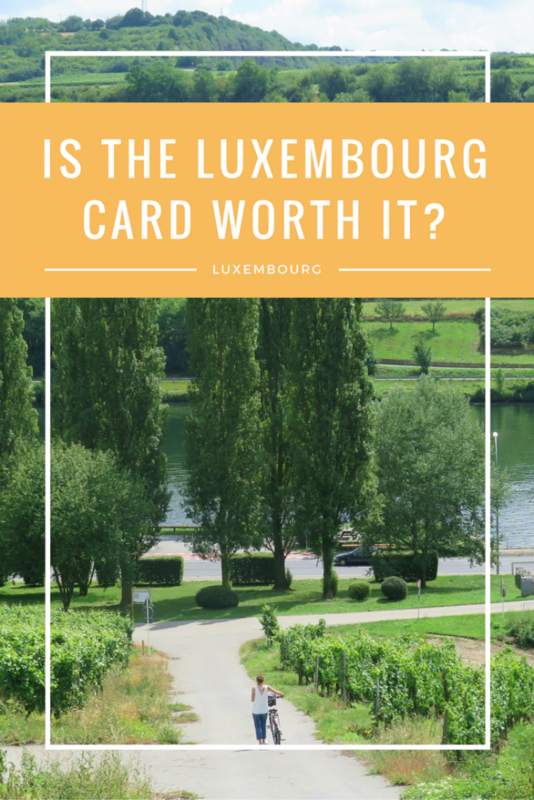 So, when I was planning my three day trip to Luxembourg and found that they had an even more impressive card (The Luxembourg Card), you can only imagine my excitement! Let’s get things straight, this isn’t a “city pass”, The Luxembourg Card is available for use over the whole COUNTRY – exciting right? 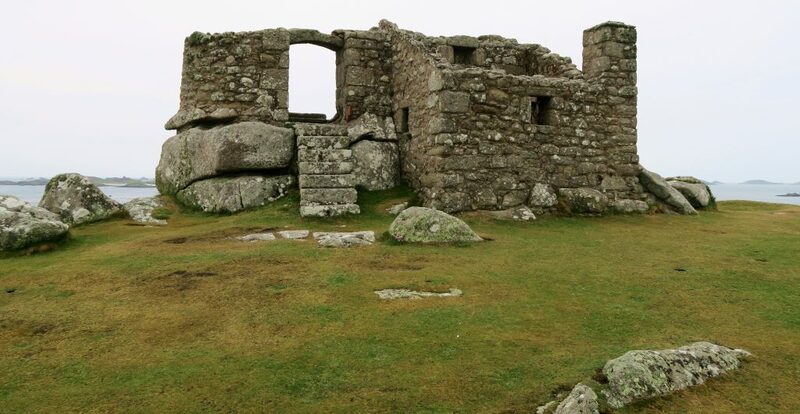 As you would expect, a large number of the country’s main attractions (including some lovely hidden gems) are free with the pass (or give you a discount on entry costs). However, the thing that really excited me was the fact that ALL train and bus lines in the country are free with the Luxembourg Card. Coming from a country like the UK where train costs are astronomical, this is completely mind blowing for me. If the UK had an equivalent all encompassing pass, I would be buying it every weekend! I won’t list all of the available attractions here, but if you are interested in taking a look, they can be viewed here. A card that encompasses an entire country including all of their transport links must be very pricey right? Think again. The card can be purchased for one, two or three days and there is an option for individual cards (1 person) or family cards (2 – 5 people). 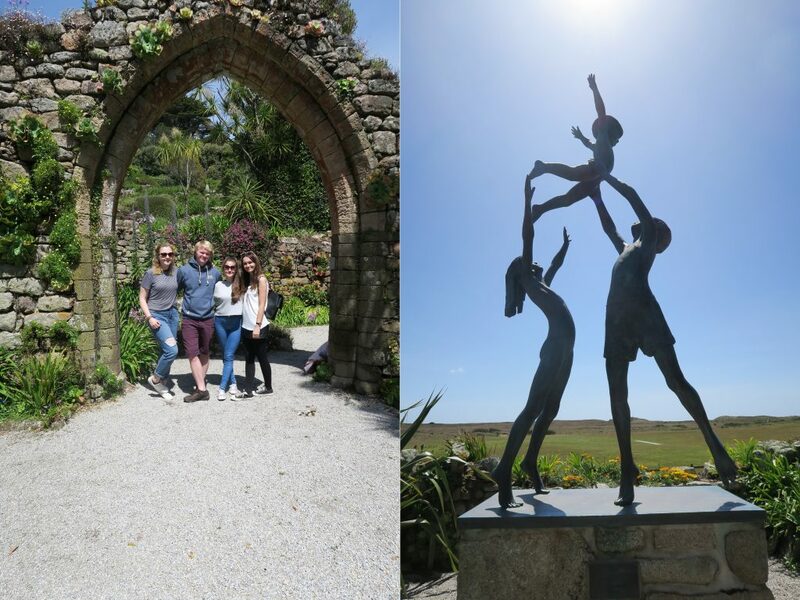 If you had a family of 5 visiting for 3 days, the cost would therefore be as little as €4.53 per person per day! Below, you can see a breakdown of all of the things we did (over three days) and how much they would have cost without the card. All transport costs are taken as estimates from Rome2Rio. 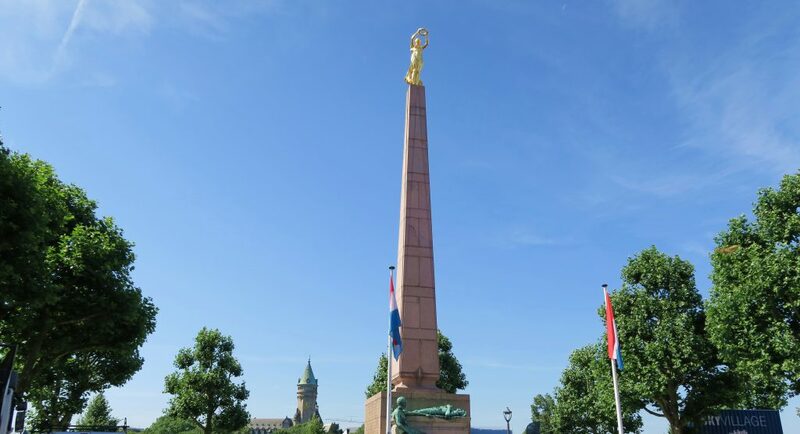 We travelled Luxembourg at a relatively relaxed and slow pace. We could have done so many more activities (e.g. 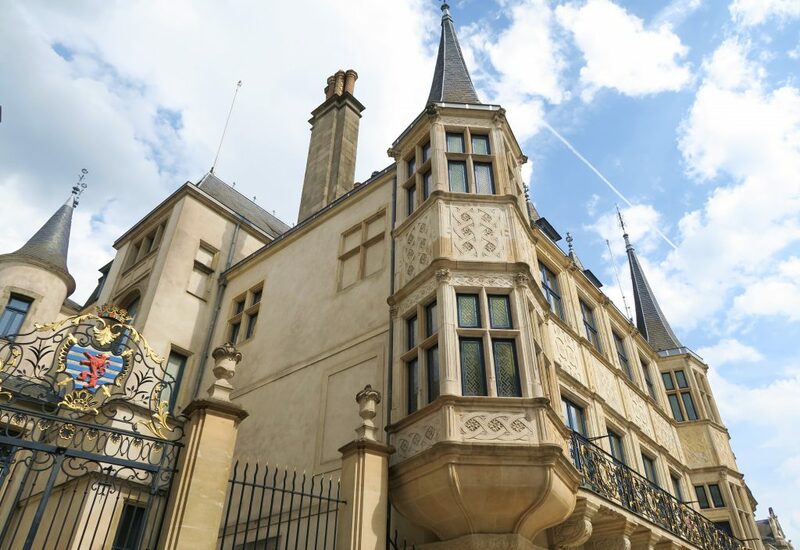 there are so many museums in Luxembourg City that we never visited – we aren’t big museum fans after all), so you could easily save even more money!With the Luxembourg Card costing €28 per person for three days and us completing activities worth €68.50, we managed to save a whopping €40.50 per person! If that’s not a bargain, I don’t know what is! 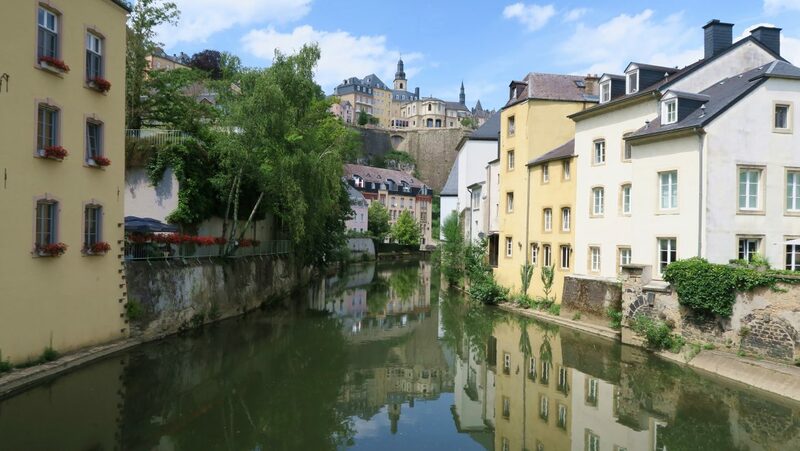 If a group of 5 adults completed our exact itinerary using the group/family Luxembourg Card, the Card would cost them €13.60 per person saving an incredible €54.90 per person! The Luxembourg card can be purchased online here as well as at many locations throughout the country. Along with the card, you should receive a VERY helpful leaflet outlining all of the attractions that are free or discounted – use this as your bible! 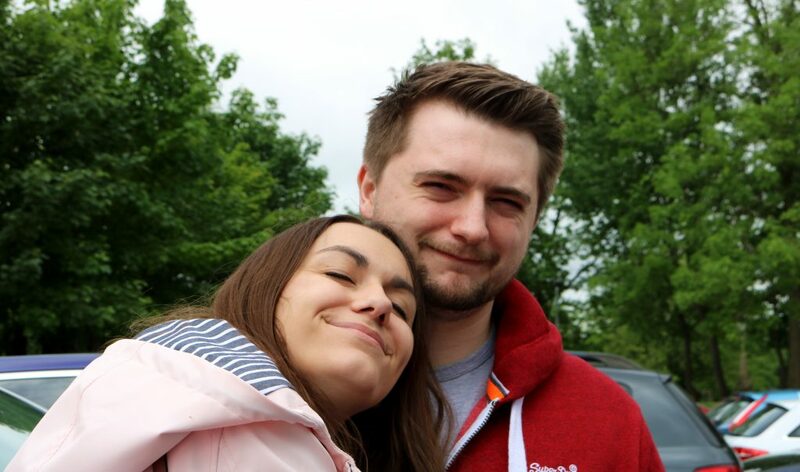 We saw so much in the leaflet that we didn’t know existed and could have easily spent another three days exploring other areas of the country! 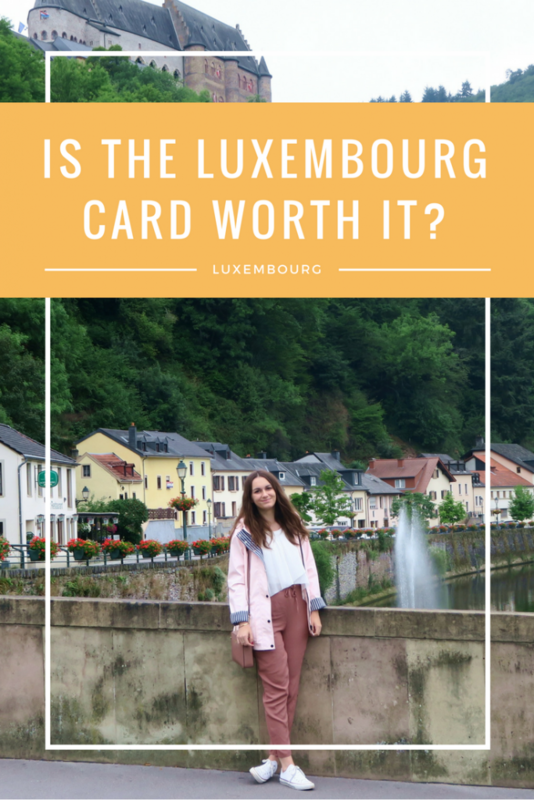 Should You Purchase The Luxembourg Card? 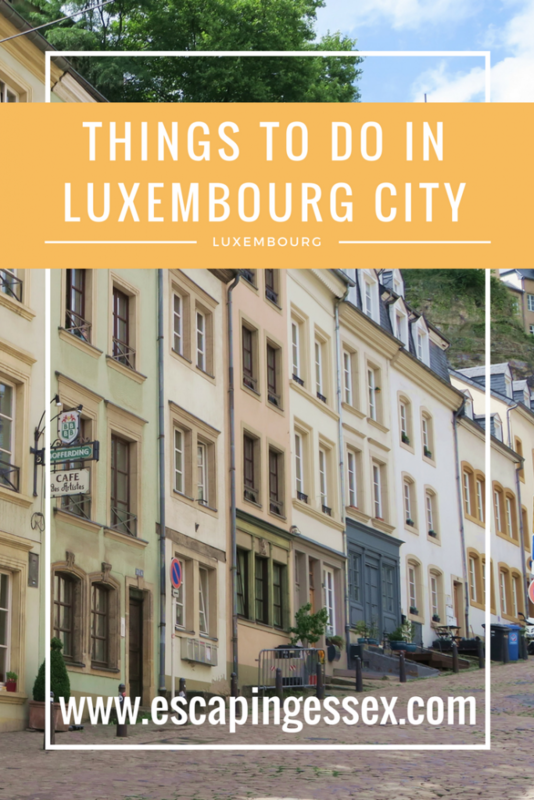 The long answer – If you plan on exploring more than just Luxembourg City, this card will be perfect for you. Saving money is obviously a great advantage but it also means your plans can be more spontaneous. With the ability to hop on any bus/train and just see where the day takes you is fab (and saves time queuing/paying for tickets). 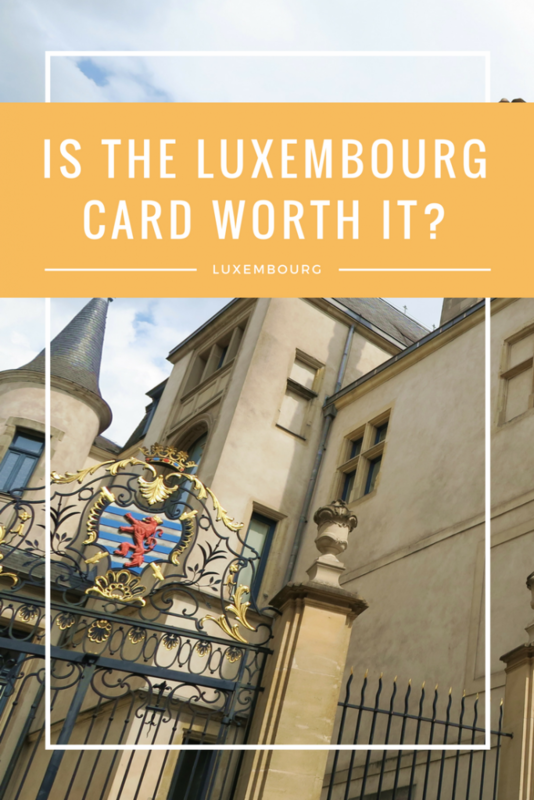 However, be aware that a vast majority of the attractions available on the Card in Luxembourg City are museums and if you aren’t big museum fans (like us), a pass may not be worth it if you are only visiting the City. Have you ever found a great city/country pass? 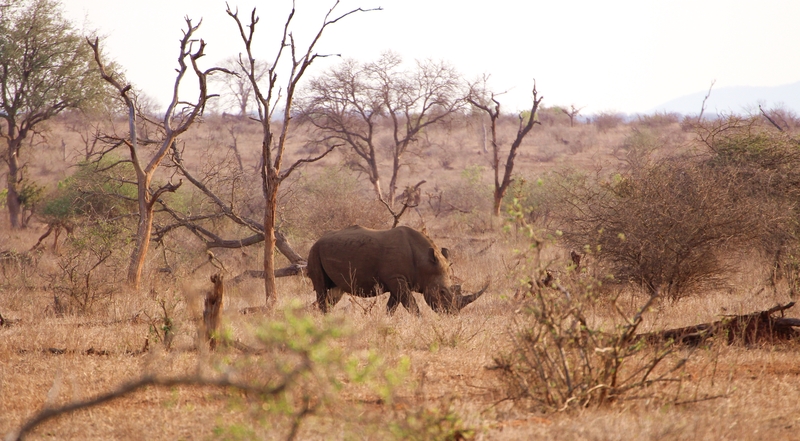 Let me know where – I’m a big fan! 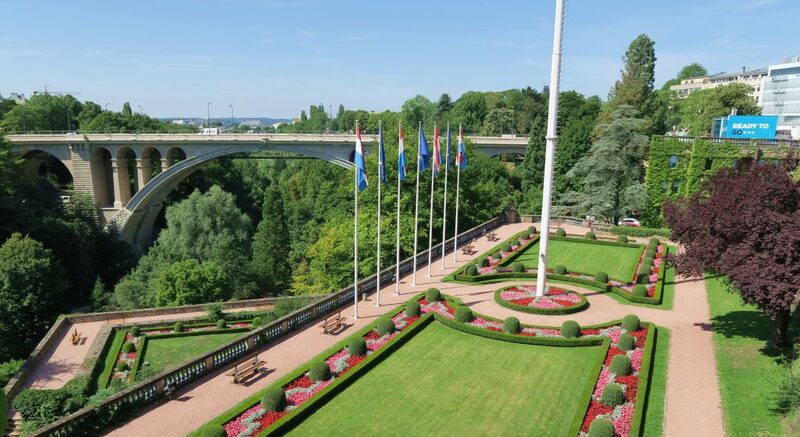 Disclaimer: While I was kindly gifted Luxembourg Cards by the Luxembourg tourism board, all opinions are my own and I certainly would purchase Luxembourg Cards for future trips. Like this post? Make sure you pin it! 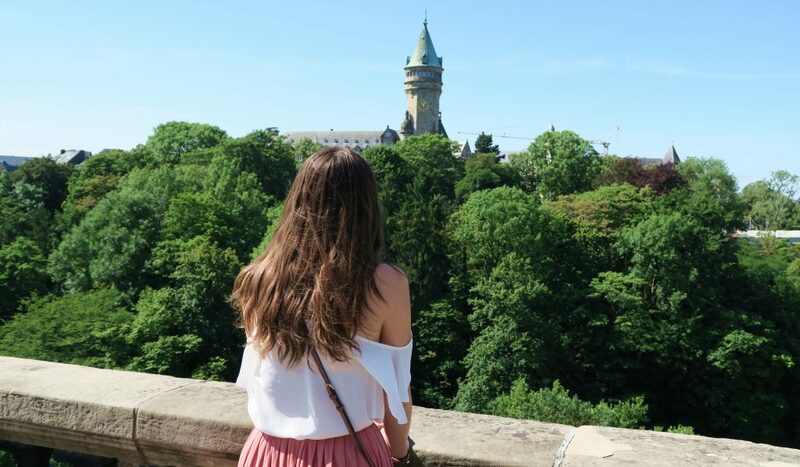 “What is there to do in Luxembourg City?” “Is it worth visiting?” “How long do we need in the City?” were all questions that rattled around my brain after spontaneously booking £20 flights to Luxembourg in the Summer. During my research, I ended up getting pretty damn distracted (typical) by the possible day trips from the city. 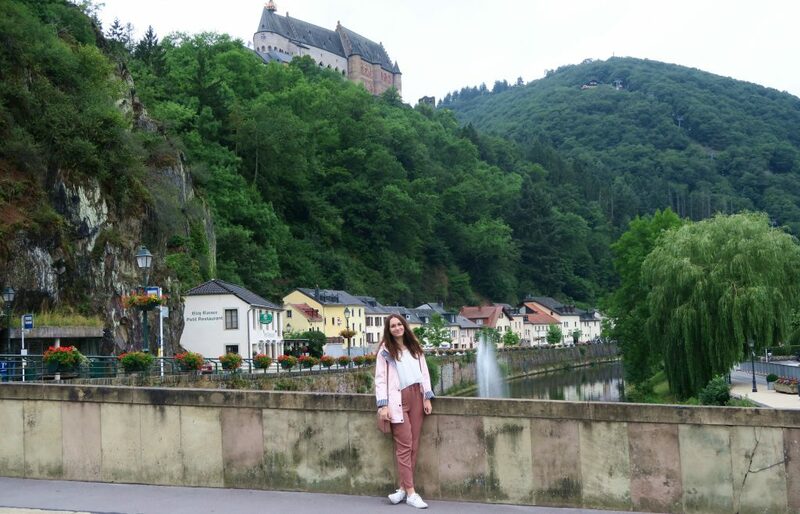 I fell in love with the idea of visiting Vianden and the Moselle Valley which left us with one day to explore Luxembourg City. Luckily, one day in the City is a perfect amount of time as it’s very small and easily walkable. As with the rest of our days in Luxembourg, we made sure to stock up on a huge hotel breakfast at the Double Tree Hilton before hopping on a bus into the city centre. Normally I like to be up and out before 9am on a short city-break but we noticed that most things didn’t open until around 10am, so enjoyed the lie-in! Our first stop was to admire the Palais Grand-Ducal (or Palace of the Grand Dukes) for a quick photo session and look around. We quickly learnt that if you are visiting in the Summer months, you are able to book guided tours inside the Palace, so we made sure to book a tour for later on in the day! 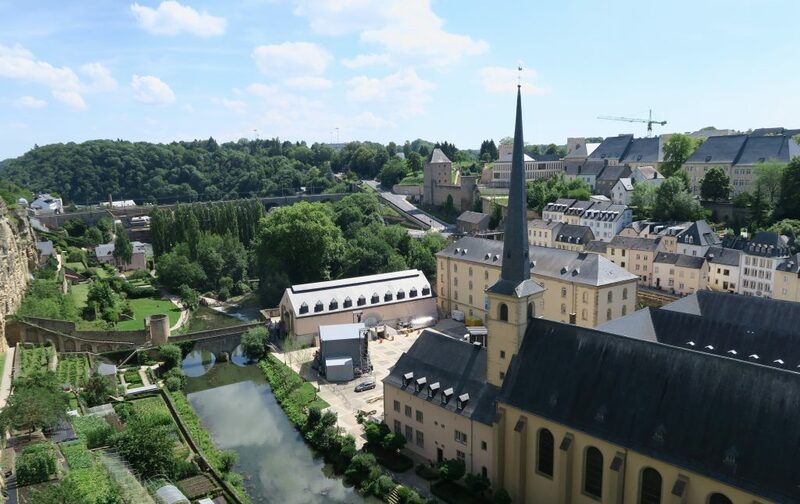 RELATED: If city sightseeing isn’t for you, don’t worry, Luxembourg still has so much to offer! 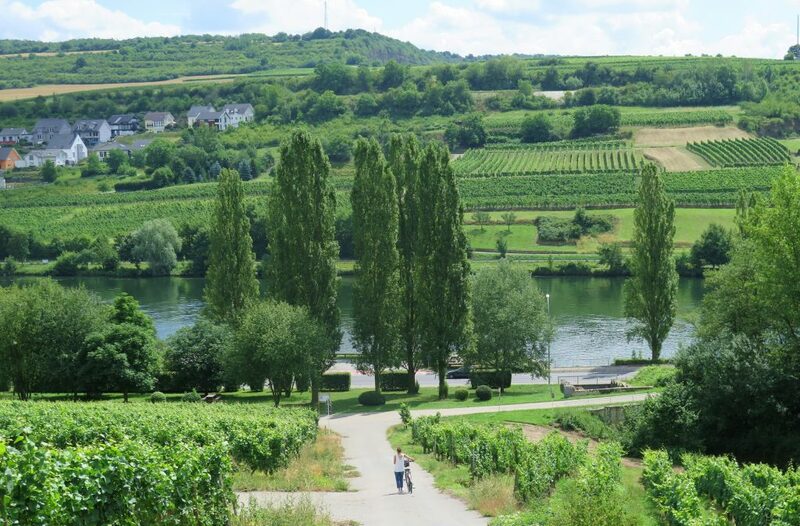 Maybe head to the Moselle Valley for wine tasting instead? After stumbling around the Palace and Cathedral, we headed to the Place de la Constitution for that postcard shot of the gardens from above. 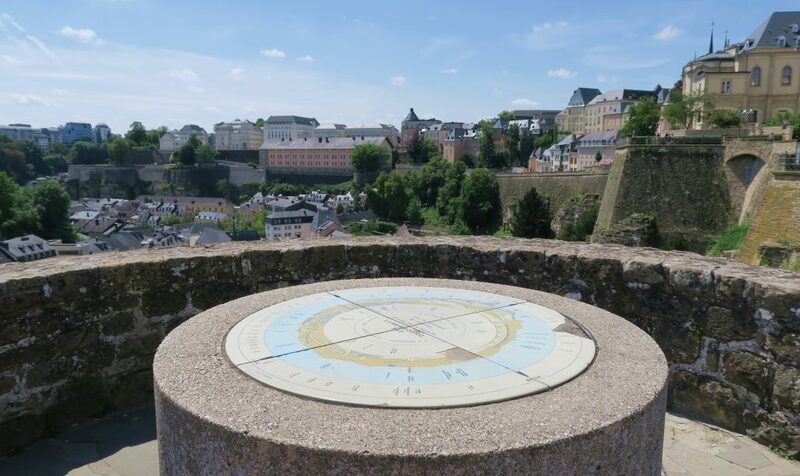 If there’s one thing that Luxembourg City isn’t short of, it’s gorgeous viewpoints! 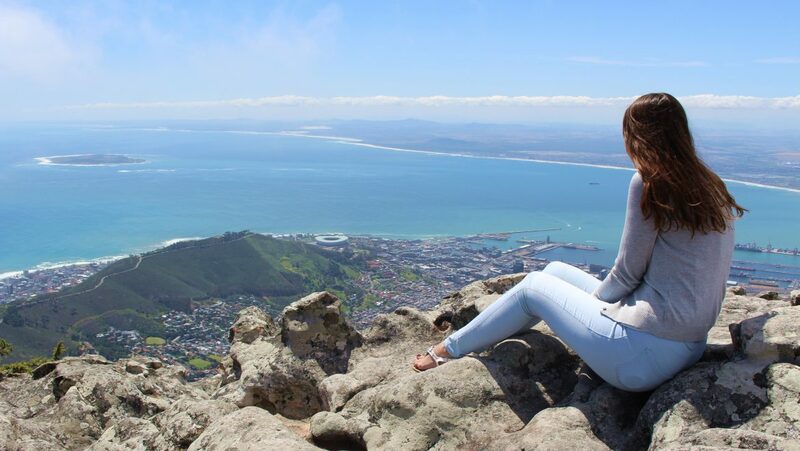 When travelling, I seem to forget that I have a completely irrational fear of heights and tend to find myself in situations that scare the living daylights out of me. This obviously happened in Luxembourg when we stumbled across “Sky Village”. Before we knew it, we were in a glass 360 rotating elevator heading skywards for better views of the city! Unfortunately Sky Village was only open for 8 weeks in 2017 and has now been dismantled – but if you’re visiting in Summer in future years, keep an eye out to see if it will be making a come back! 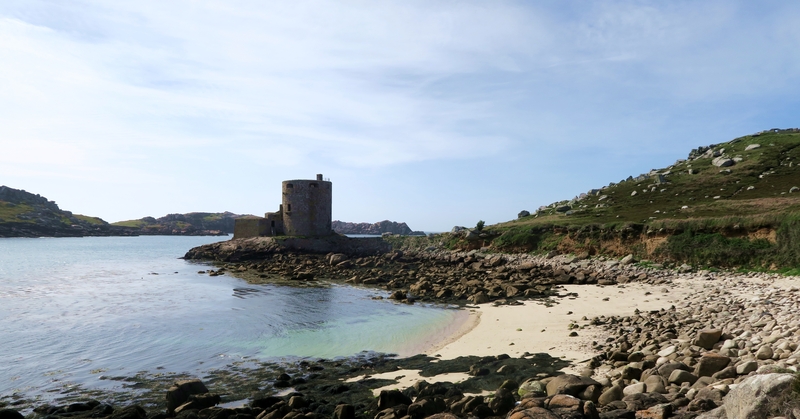 With us in the mood for more beautiful viewpoints, we set off in the general direction of Le Chemin de la Corniche but got mightily distracted (and/or lost) along the way. 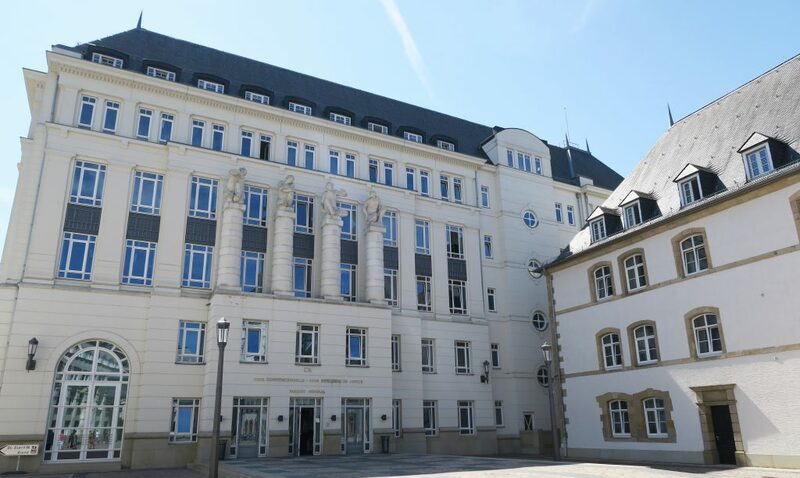 First up on the list of distractions was Cité judiciaire (Judiciary City) which is the home of the judiciary and governmental buildings in Luxembourg. Of course, you can’t enter these buildings (unless you’re an important person), but the area is gorgeous and lovely to have a walk around. Now, Le Chemin de la Corniche is referred to as “The Balcony of Europe” and is supposed to have the most spectacular views of the city but I was just as impressed with the walk there! 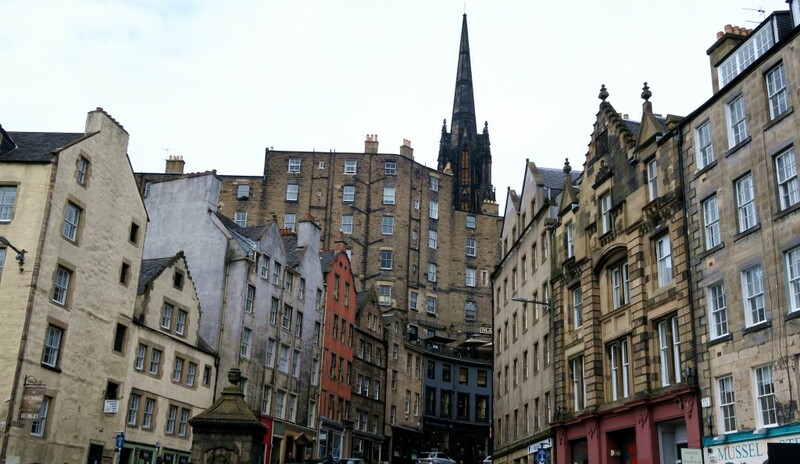 We stopped regularly to take photos of the dramatic city scenery (preferably under trees/various other shade giving obstacles as our day in the city was BLIMMIN’ BOILING). Lunchtime! After a morning of wandering around in the boiling hot sun, we hobbled over to the closest food establishment that we could see (hopping and skipping through the shadiest areas as best as possible – almost acting as if the non-shaded floor was lava). Unfortunately this means that we ended up in a pub/bar type place with London themed decor – as I am in London on a daily basis, this wouldn’t be my usual choice of restaurant when abroad but hey, it did the job! RELATED: Not all of our days in Luxembourg were quite so warm! 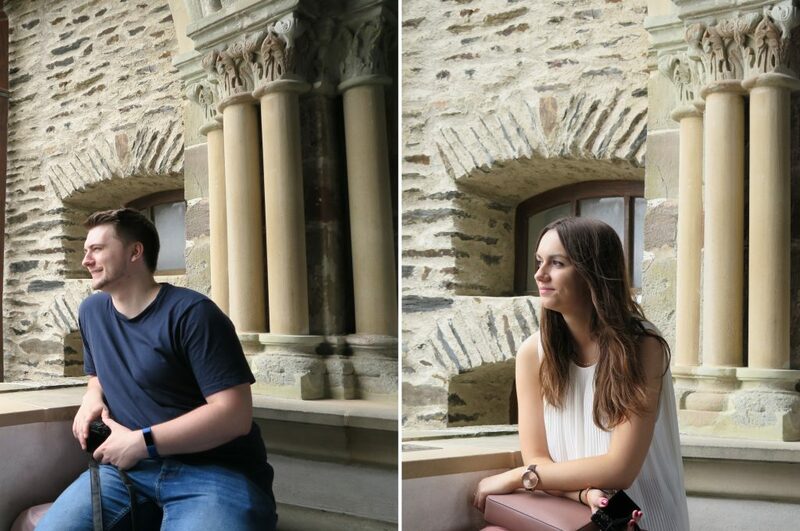 Read about our day trip to Vianden which was absolutely beautiful despite the drizzly weather! 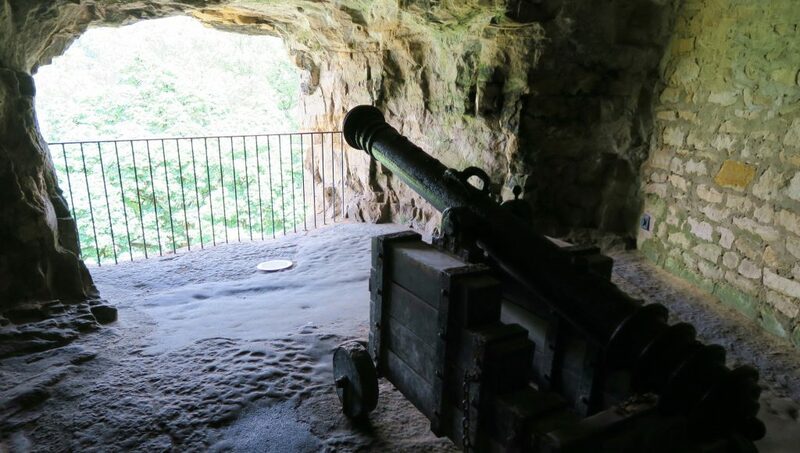 Next up on our list of hot-spots was the ever-popular Casemates du Bock, a series of tunnels and look out points weaving through the city’s fortified walls. 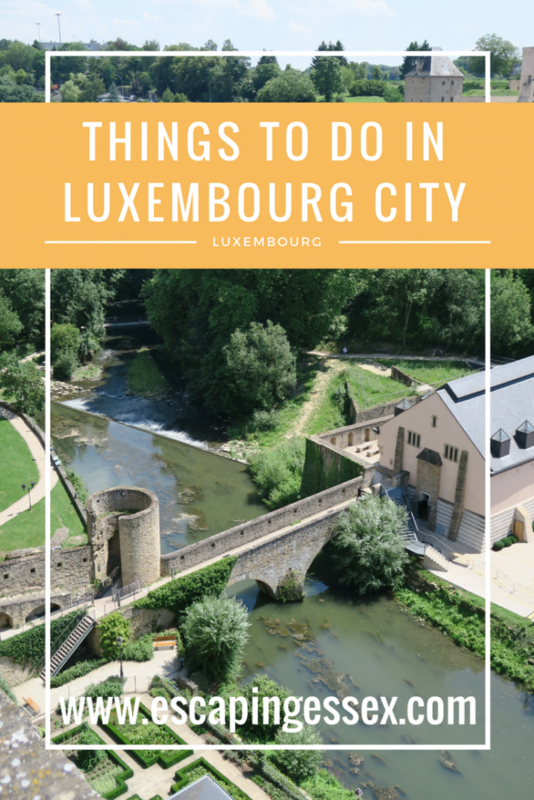 While the tunnels aren’t as extensive as I first thought they would be, this certainly isn’t something that you should miss on a trip to Luxembourg! The fortifications were built in the year 963 (which is pretty damn impressive in itself) and give a good insight to the history of the country. The Casemates are free to enter if you have the Luxembourg Card (which I highly recommend for any trip to Luxembourg)! We had some time to spare before our tour of the Palace and after spotting many gorgeous Instagram shots of the “Grund” area, obviously this was my next place of choice. As you can see, this day was adopting a bit of an “Instagram worthy viewpoints” theme and I am TOTALLY okay with this. At this point, the relentless sun still wasn’t easing up. 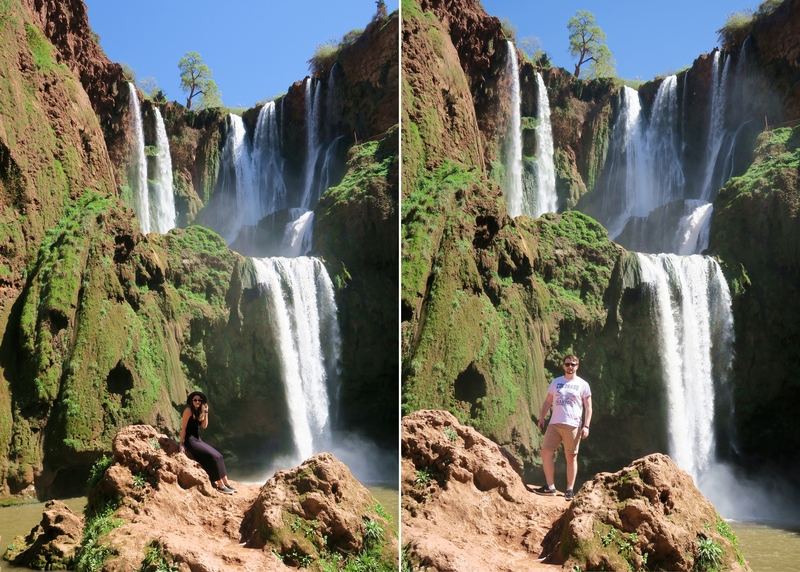 The obvious solution to this was to enjoy the view with an ice-cream and a drink! 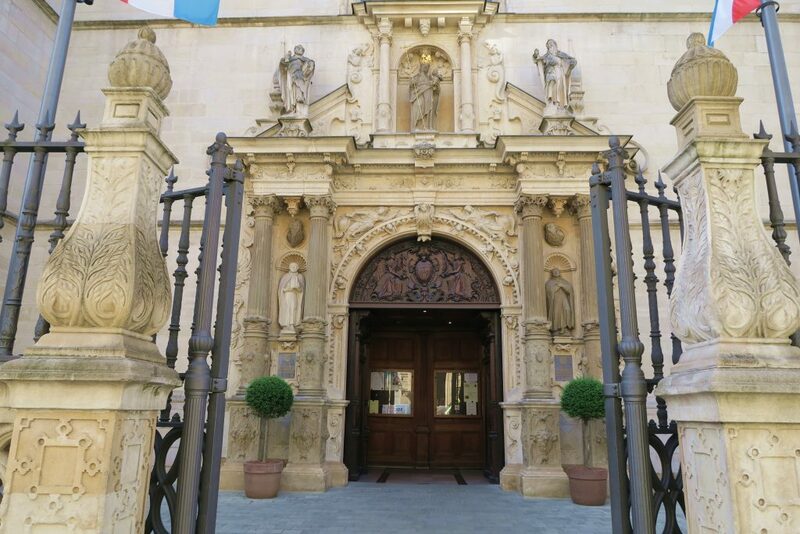 Grund can be accessed via a long walk down from the main city centre or a few elevators down to the lower level. We decided to be lazy and take the elevator down from the Cité judiciaire and back up again to make sure that we could get back to the Palace in time for our tour! It was finally time for us to take our tour of the Royal Palace. Unfortunately photos aren’t allowed inside, so I can’t show you just how lovely the Palace is – but that means you just have to visit it for yourself! The Palace is only open to the public during the Summer months and I definitely recommend visiting if you are able to! Never fear, if you are visiting in Winter instead, apparently the City has fabulous Christmas markets, so you won’t be missing out! Opposite the Palace is the famous Chocolate House! If the day was cooler, we would have definitely been popping in for a luxurious hot chocolate. Instead, we just had a look around and took some photos – the cake also looks incredible! And with that, we grabbed some food and headed to the airport for our evening flight home! 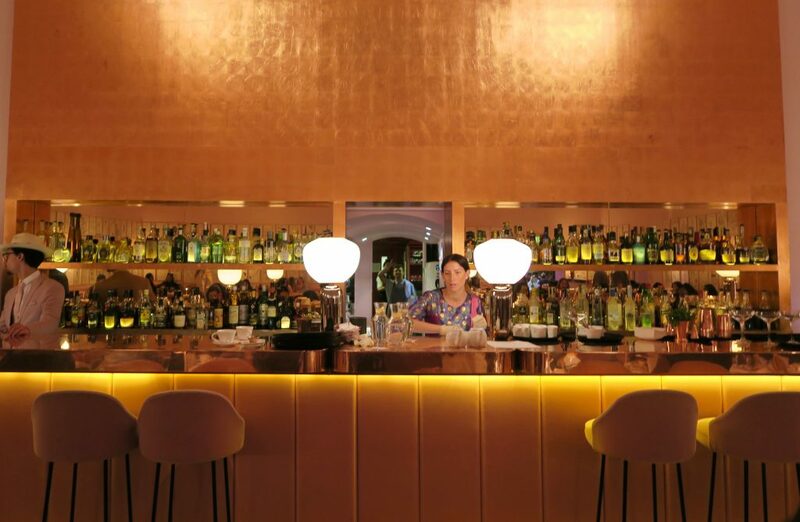 While Luxembourg City is small, you won’t run out of things to do if you are only spending a day or two here. We decided to skip all of the museums because of our limited time frame. As it was such a hot day, we were travelling at a snails pace compared to normal; taking time to sit and drink/spend some time in the shade was very much needed during the day – you may be able to fit much more into a day than we did! 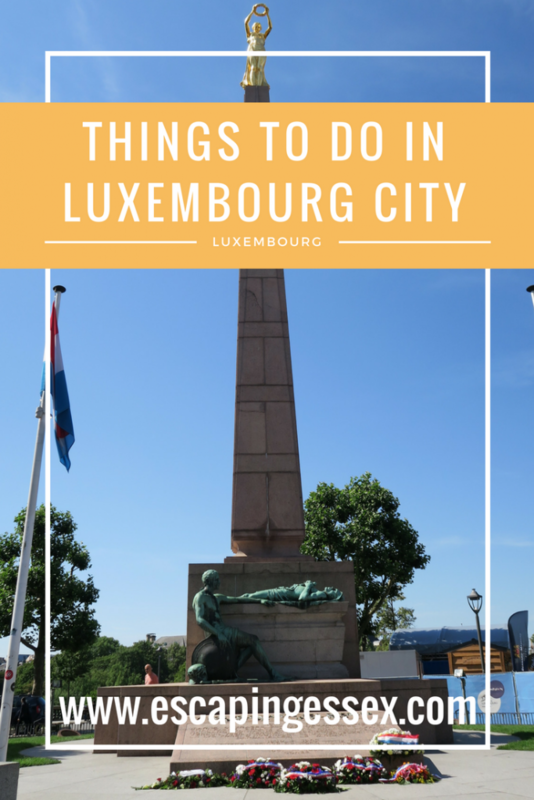 Have you ever been to Luxembourg City? How did you spend your time there? Disclaimer: This is not a sponsored post and all thoughts are my own. However, I was kindly gifted a Luxembourg Card by the tourism board. Like it? Be sure to pin it! A picturesque town with an impressive castle? Get me there immediately. 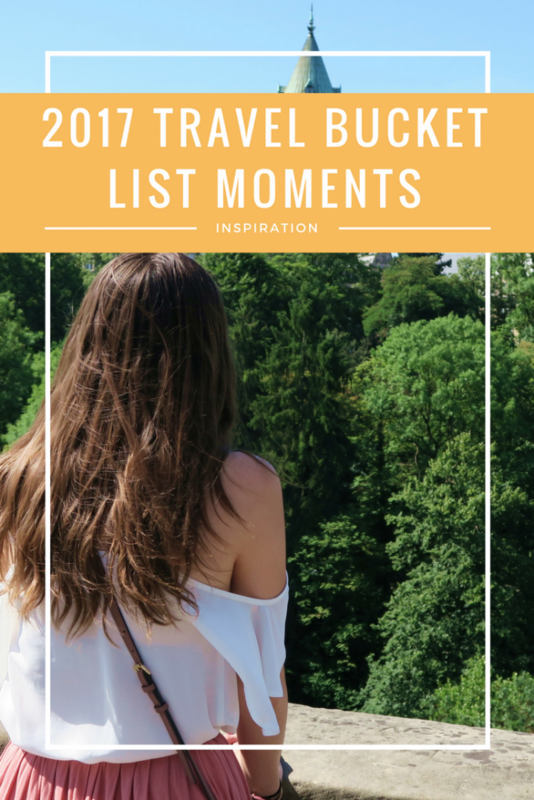 As soon as our trip to Luxembourg was booked, Vianden was on my radar and I couldn’t wait to explore! Despite our first day in Luxembourg being the gloomiest of them all, we set off early with high spirits. 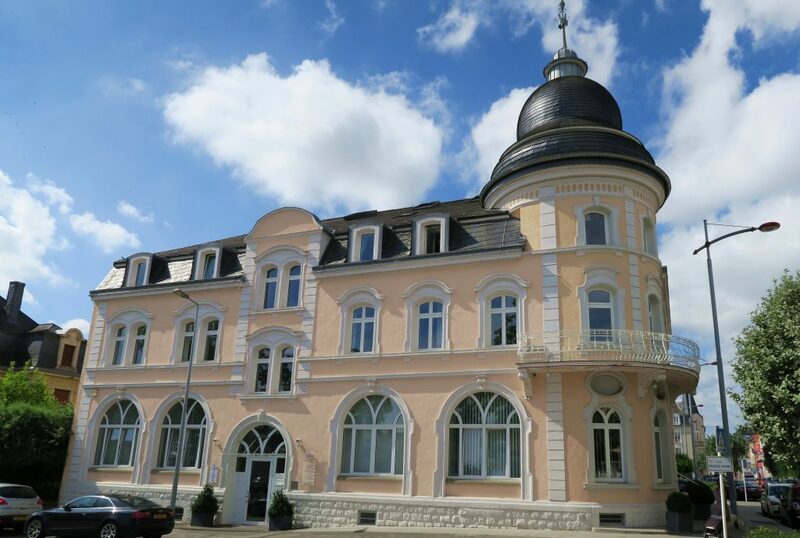 As we were staying at the DoubleTree by Hilton which is slightly outside of Luxembourg City centre, we walked to the Dommeldange Station (rather than a station in the city centre) and hopped on the train to Ettelbruck which takes a quick 30 minutes. On arrival at Ettelbruck station, there are three separate bus stops, so be sure to stand at the correct one (“routriere 2” if I remember correctly) before hopping off the bus at Vianden Bréck. 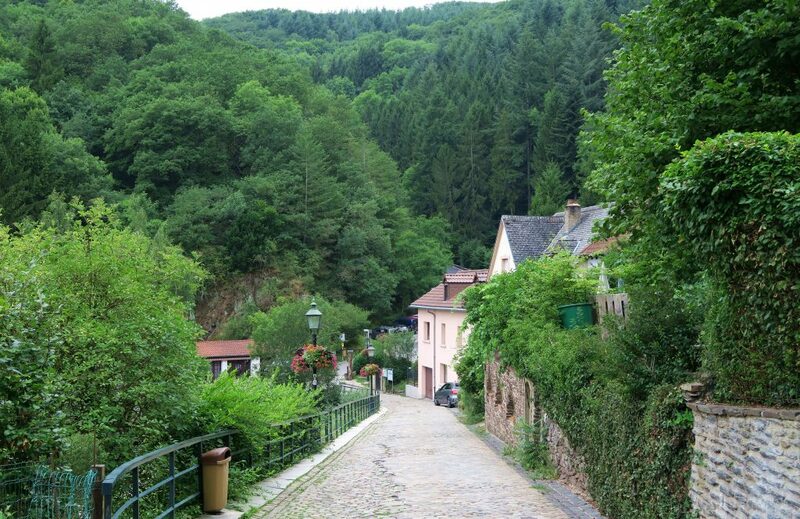 There are a few bus stops in Vianden but this one was in the perfect place to get off and explore! RELATED: Train and bus travel is extraordinarily easy and efficient. 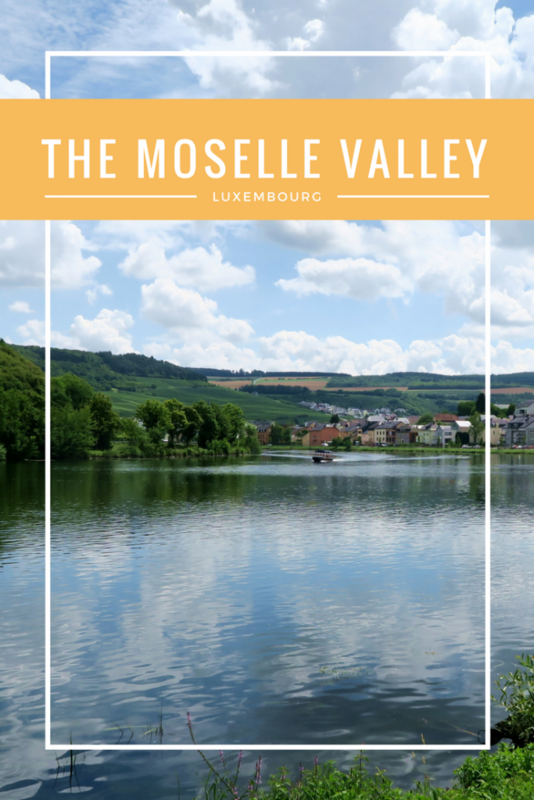 If you’re looking for another day trip from Luxembourg City, I highly recommend a trip to the Moselle Valley! 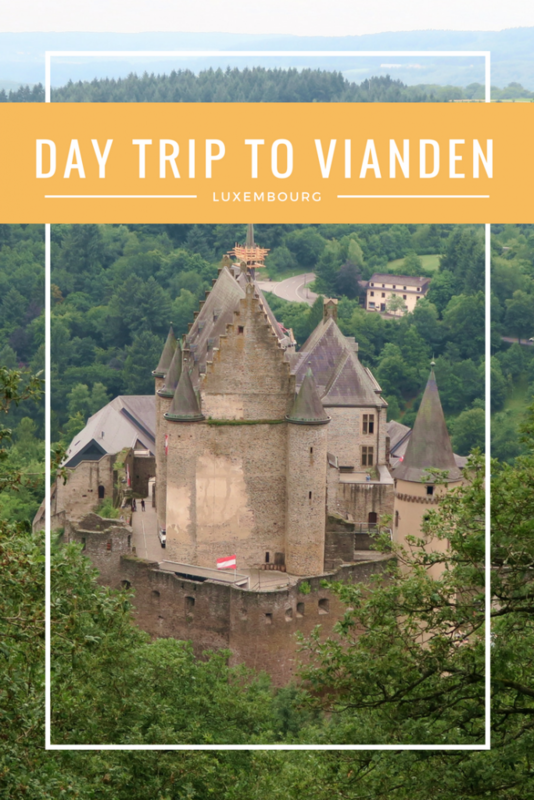 Vianden is another area of Luxembourg where I would highly recommend using the Luxembourg Card! Not only was our transport to the town completely free, so were most of the attractions! If you plan your day in the same way we did, you’ll only end up paying for food and drinks during the day! 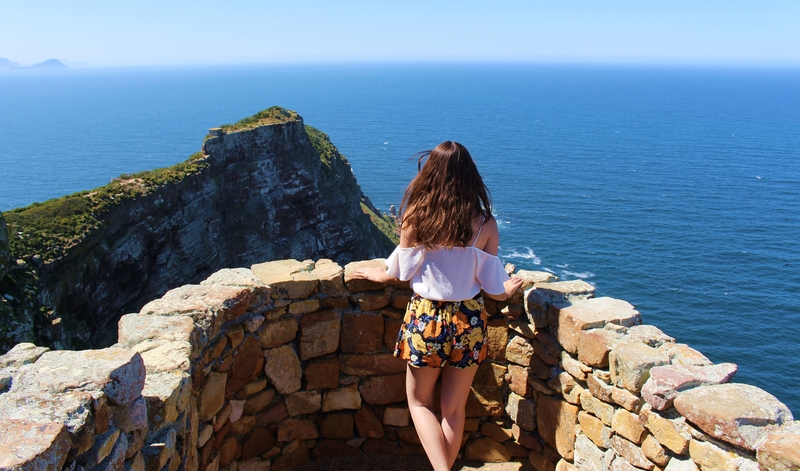 It’s no secret that I am scared of heights, but I had been told by many reliable sources that the views from the chairlift were unrivalled and I will do anything for some good scenery (it’s all about that Instagram grid after all). Sweaty palms and a fair amount of squealing later, we were off and it wasn’t that bad after all! My hands were steadily gripped to the safety bar, so my photo taking abilities were somewhat hindered but I did it! 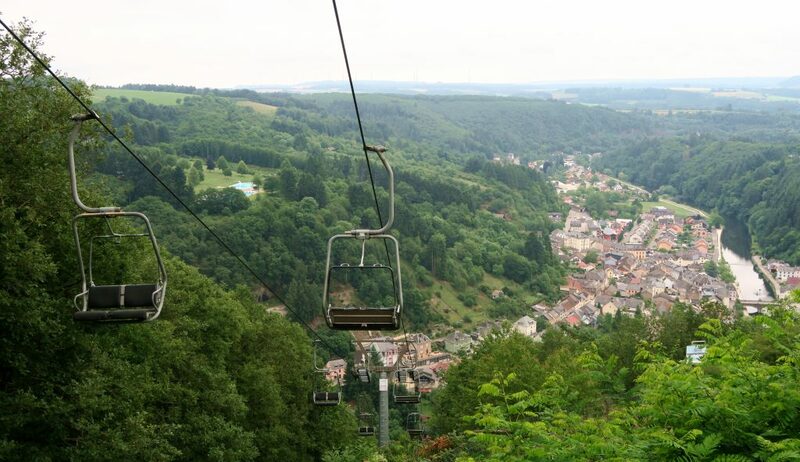 The views definitely live up to the hype from both the chairlift itself and the viewing deck at the top! 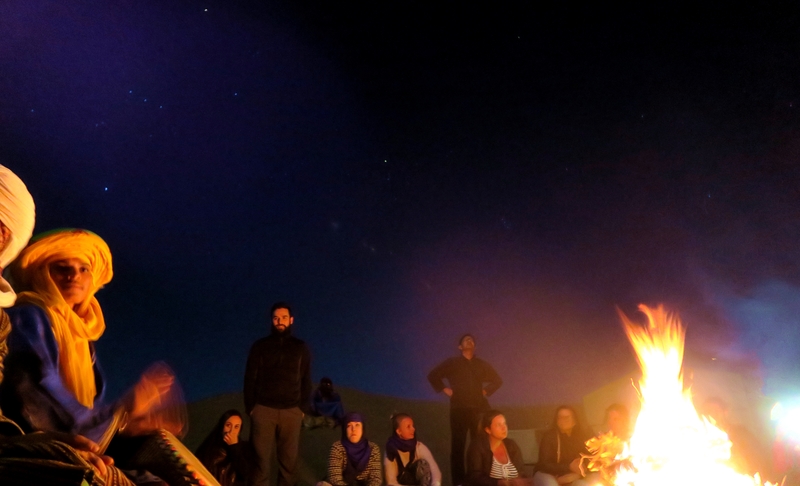 RELATED: Do you push your fears while travelling? My fear of heights is always tested while travelling – it’s safe to say that dinner in the revolving restaurant at the top of the CN Tower was an experience! The chairlift actually takes you above the height of the castle and therefore you need to walk downhill slightly to reach the castle’s entrance. 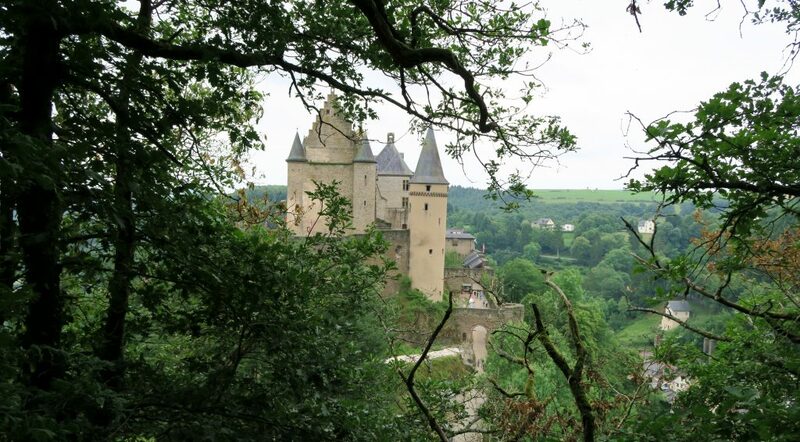 Approximately 33% of Luxembourg’s land is covered by beautiful woodland and this walk is no exception! It’s an easy downhill stroll, however it’s probably a good idea to wear sensible shoes to conquer the dirt path! 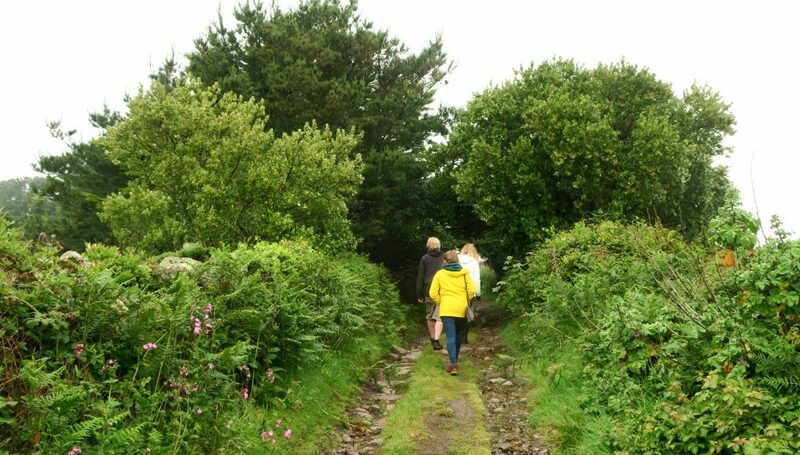 But as it’s such a pretty walk, you won’t mind taking your time in unsuitable shoes! Catching glimpses of the castle getting closer through the trees is also exciting! Undoubtedly, the castle is the main reason that most people visit Vianden! 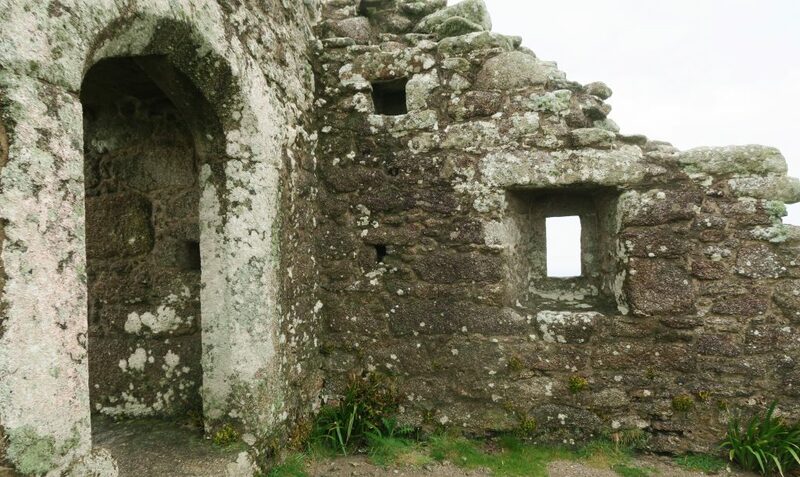 You are free to explore the castle at your own pace, so there is no reason to wait for a guided tour etc. 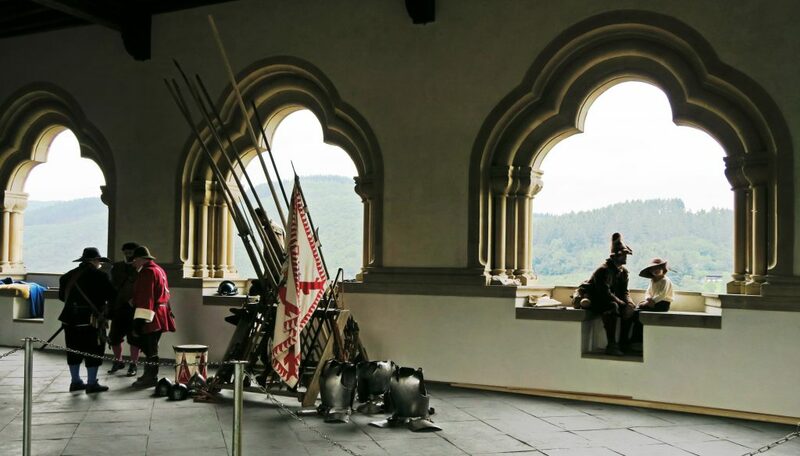 When entering the castle, we didn’t notice the audio tour headsets but they would have been helpful at some parts of the visit – predominantly the museum element where signs for items on display were in French. 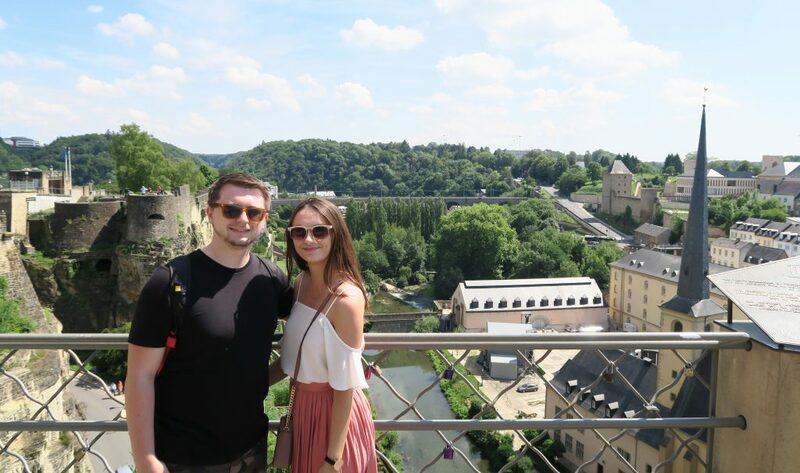 The castle is absolutely gorgeous and definitely worth your time if you visit Luxembourg! 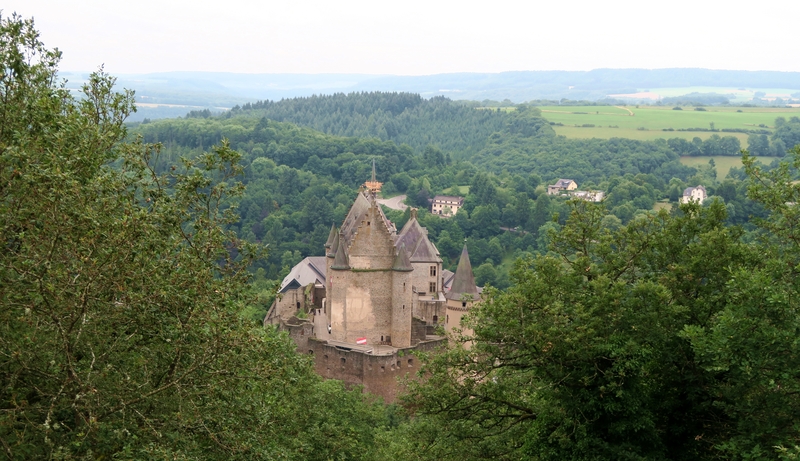 RELATED: I seem to find myself always visiting rural castles in Europe – have you read about my trip to Burg Eltz? 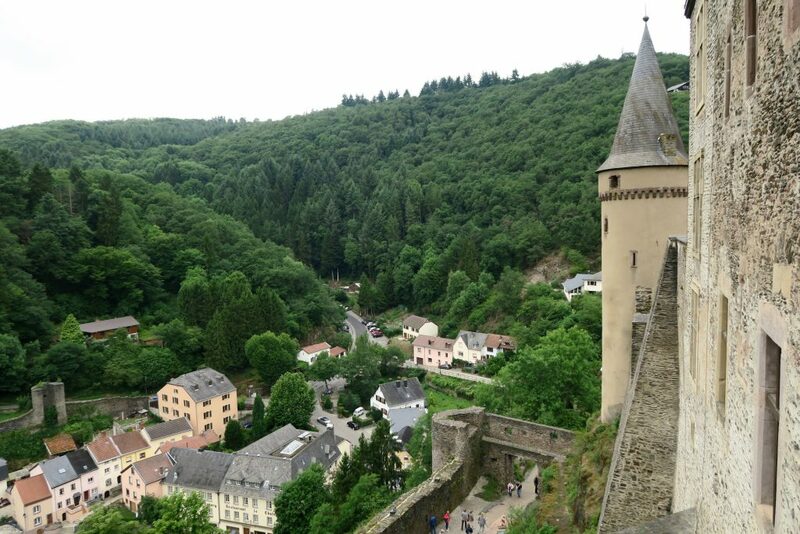 While the castle steals the limelight and is the reason most people visit Vianden, the rest of this little town is definitely worth your time too! 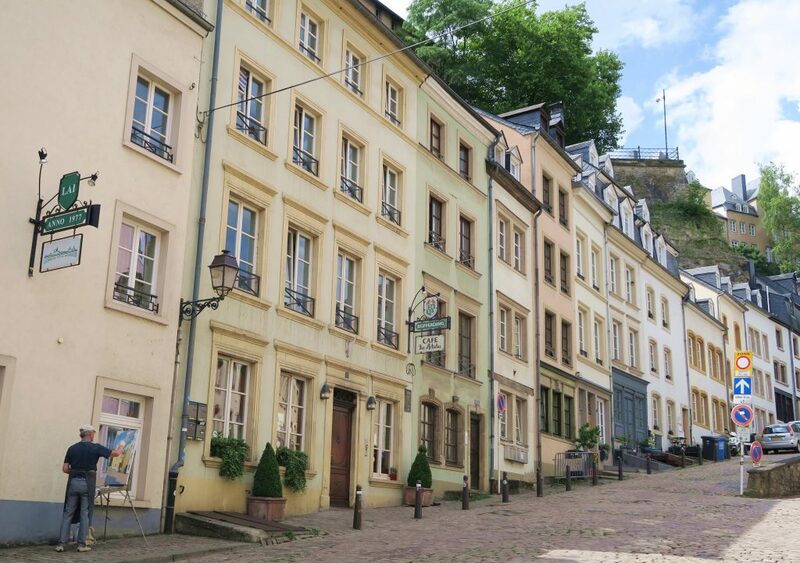 Vianden is filled with picturesque little streets lined with gorgeous buildings and plenty of colourful flowers. 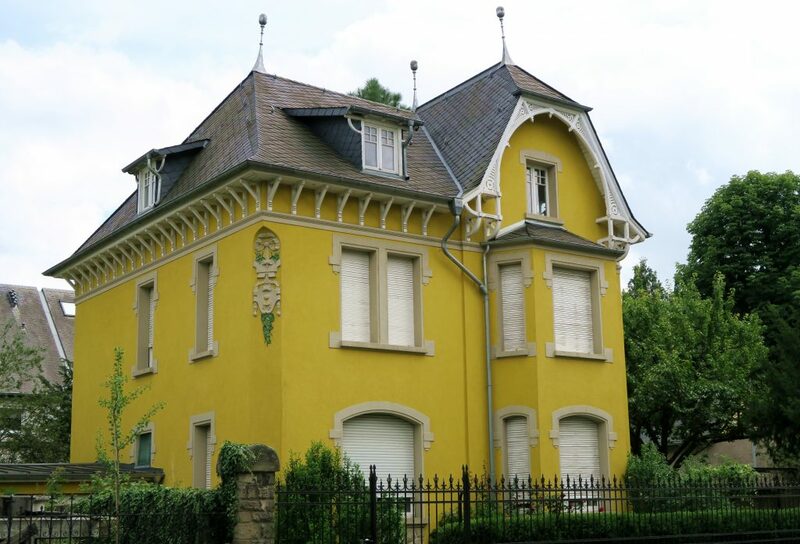 The houses in Luxembourg are unlike anywhere I have ever seen before. 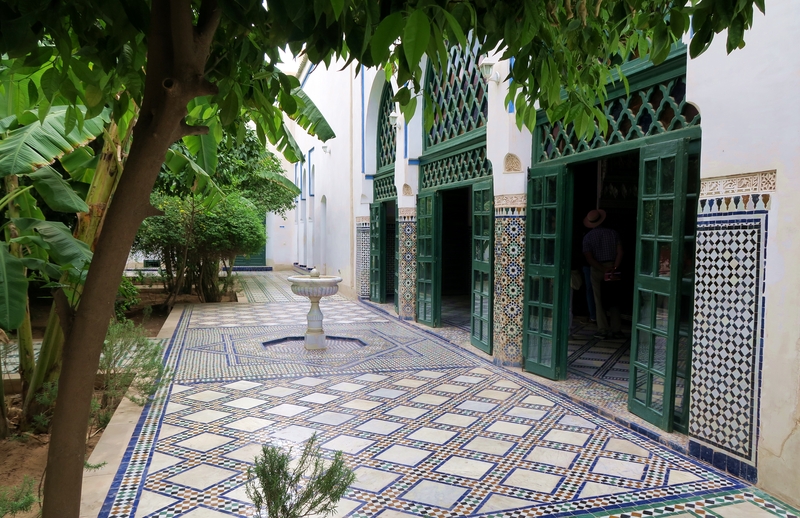 While many of the houses don’t depict a particularly modern style, you can tell that this is a very rich country and most of the houses are maintained to perfection. As with most picture perfect towns, there are lots of cute little eateries lining the streets. 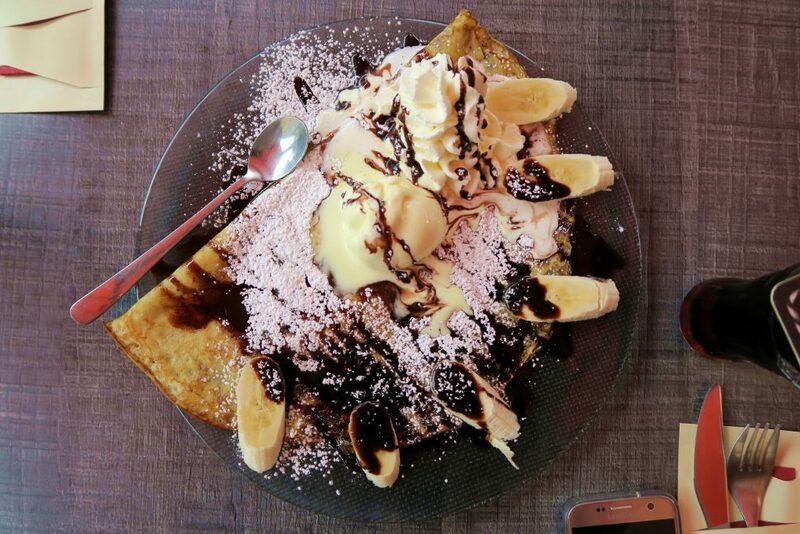 We opted for a crepes – obviously! 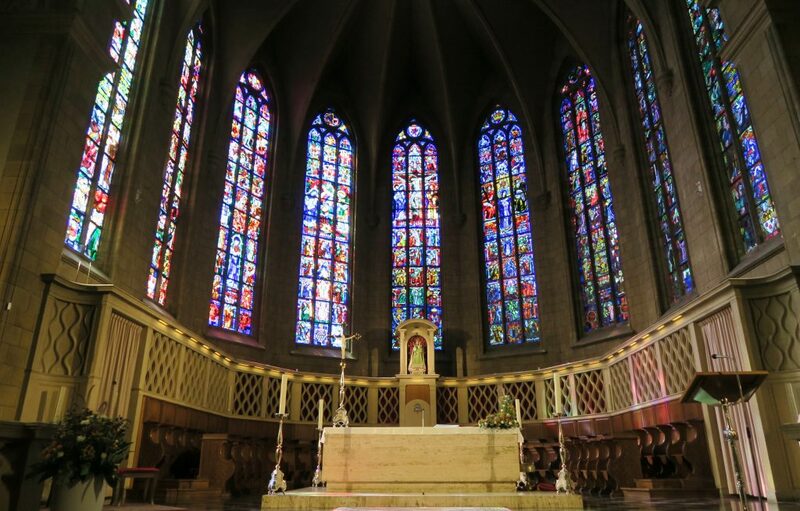 Trinitarian Church – After searching TripAdvisor before our visit, a quick look inside this church was on my to-do list but we ended up accidentally walking straight past it – oops! Adventure Park Tree Climber – If you’re from the UK, think “Go Ape” – this would be a great idea to keep the kids entertained after dragging them round the cultural sights! We definitely would have joined in if we were suitably dressed. Maison de Victor Hugo – A small museum about the French novelist Victor Hugo, set in the house that he lived in for a short period in the 1870s. 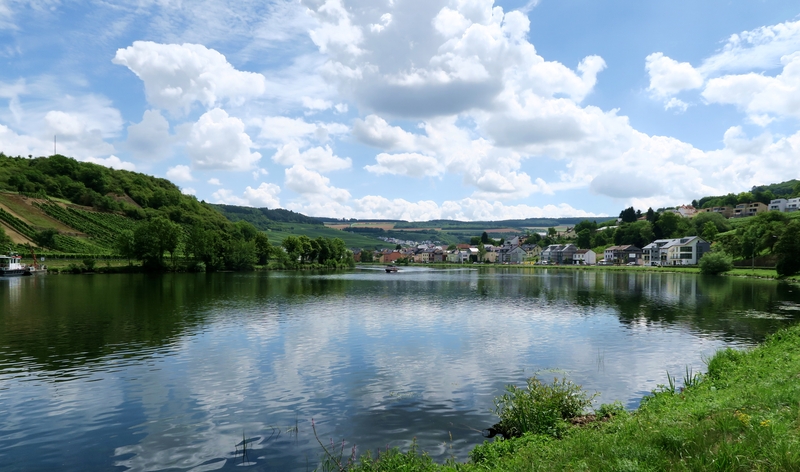 Have you ever visited Vianden? Did you have a good time? 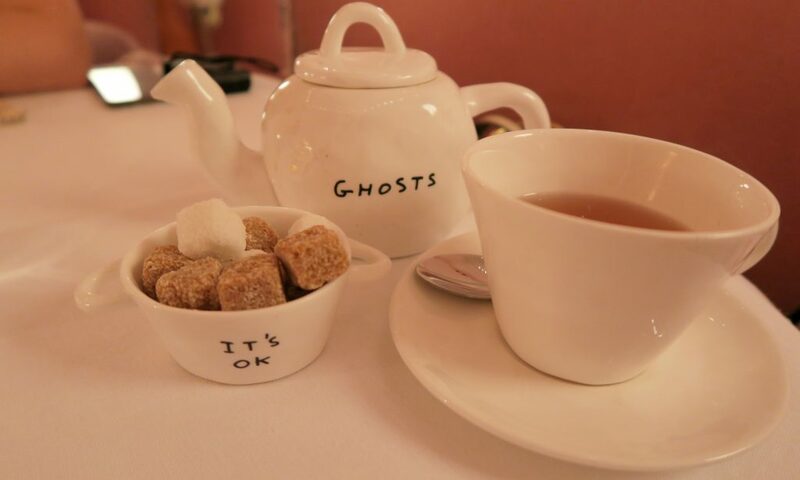 So apparently it’s now the very end of National Afternoon Tea Week in the UK! I don’t know who made up all of these celebratory days/weeks, but this is one I can definitely get on board with. 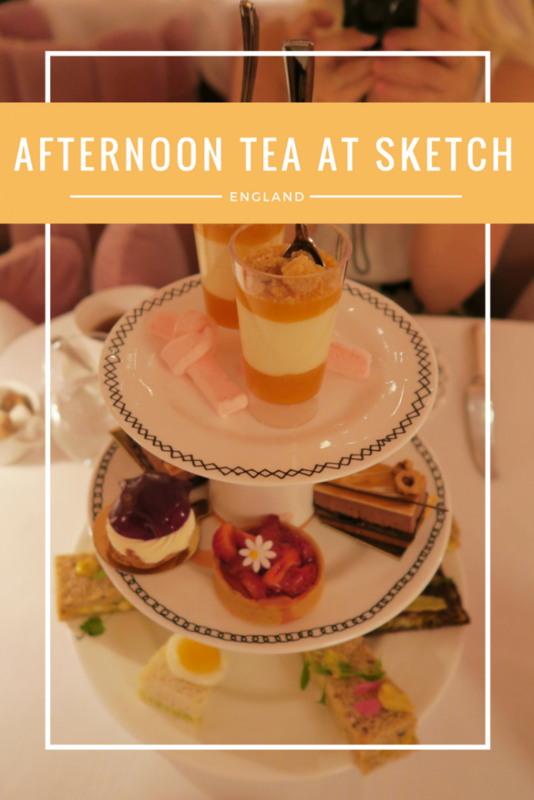 Coincidentally, last weekend Amy, Charlie and I had Afternoon Tea at Sketch. I also bought a new book on National Reading Day last week, without knowing that it was National Reading Day – apparently I’m really good at accidentally obeying these fake celebratory days! 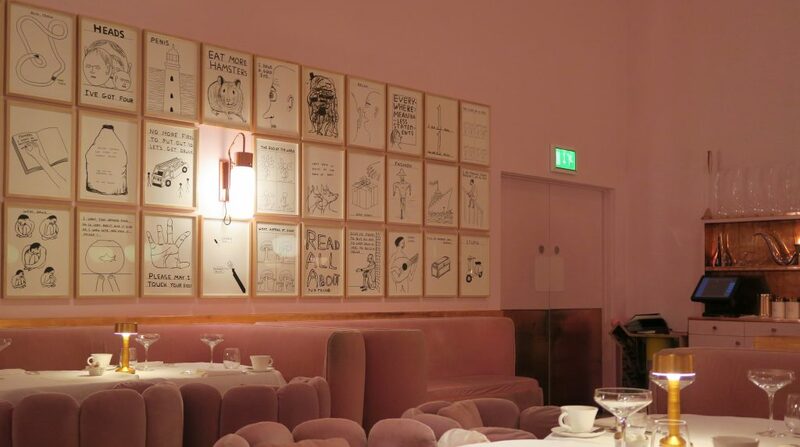 Lets face it, most people visit Sketch for it’s gorgeous interiors rather than the prestigious 2 Michelin star food. 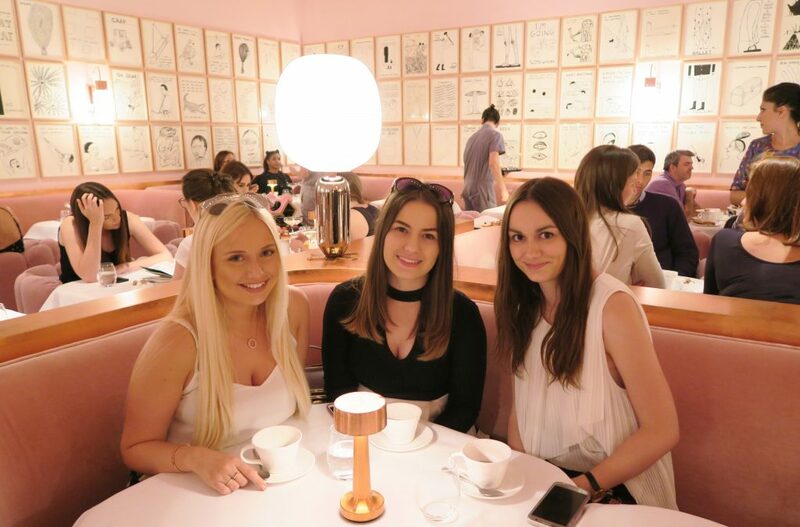 There are 4 dining rooms spread over three floors and the afternoon tea is served in the “Gallery”, a very pretty pink and girly room. 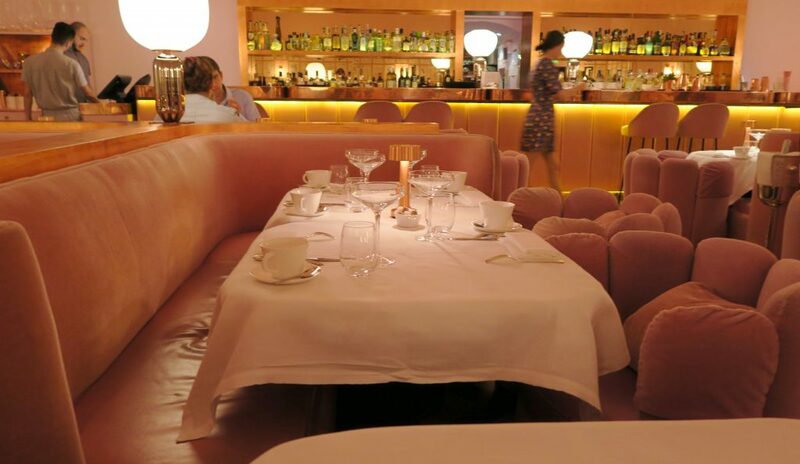 Pink walls, pink suede chairs, rose gold accents and even a man in a pink suit (which I was so totally jealous of). Be warned, the low elegant lighting in the Gallery is absolutely shocking for photographs, so I apologise in advance for shoddy photos! 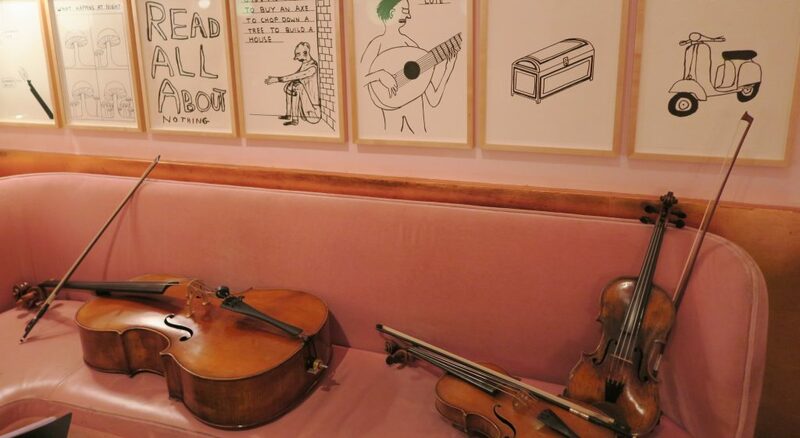 The elegant vibe is enhanced by the string trio who played a whole host beautiful acoustic music – my favourite being The Circle of life from the Lion King! 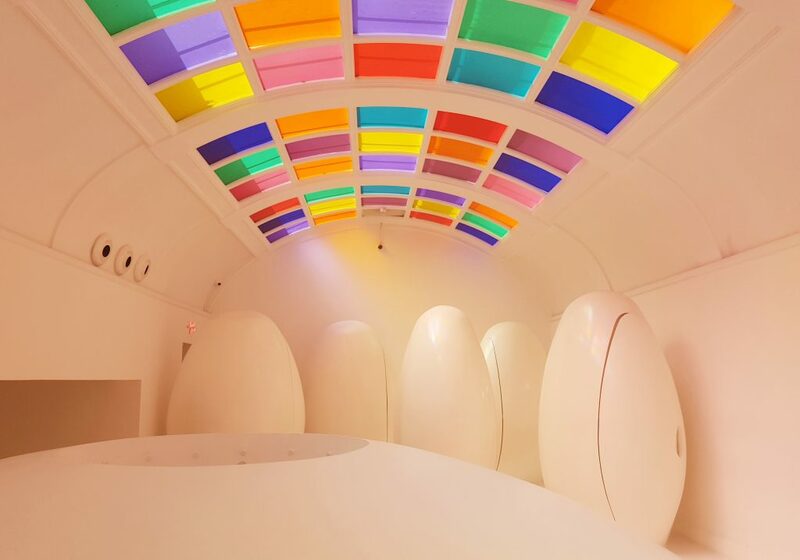 It wouldn’t be right to not speak about the toilets when talking about Sketch – these futuristic pods have become a tourist attraction in their own right! I’ve never seen so many people taking photos in the toilets (no, not even on a club in Chelmsford on a Saturday night). 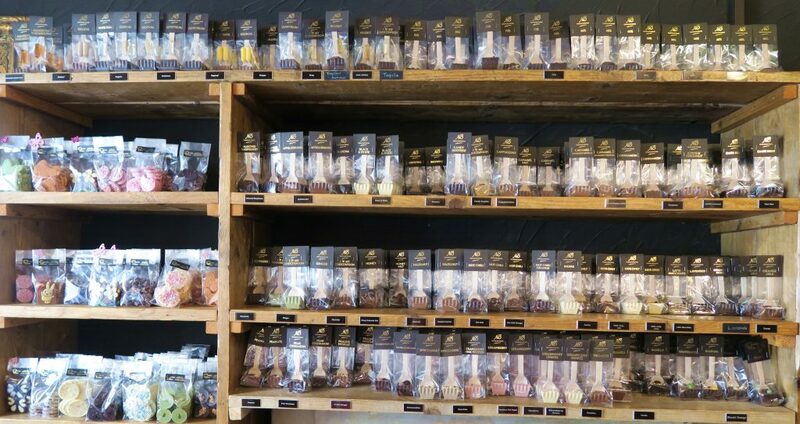 First up was the choice of tea – where you will be spoilt for choice! I am no tea connoisseur (in fact I only started drinking it this year – am I even British?! ), but I don’t think you could make a wrong choice; and even if you did, you can just ask to swap it for another! RELATED: At Christmas time, I visited B Bakery for their “Festive Afternoon Tea”. If pink and girly isn’t your vibe, maybe you’re better suited to this one! And you can read all about it here! Shortly after the arrival of the teas, “The Caviar Man” paid us a visit. A man dressed in a funky pink suit presented us with a small dollop of caviar along with an egg concoction with cheese bread sticks. I don’t eat fish, so struggle with the concept of caviar and didn’t eat this – but I would have happily taken more of the cheese bread sticks! 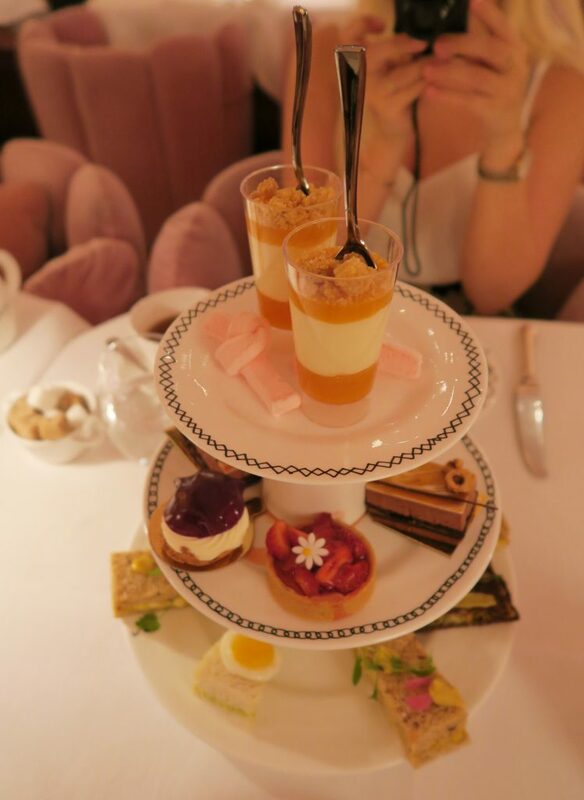 Then came the big moment – the arrival of the sandwich/pastries on the classic three tiered cake stand. The sandwiches on offer were duck egg and mayonnaise, coronation chicken, smoked salmon and Jacob’s cream and finally a tomato chutney, lettuce and mayonnaise concoction. As I don’t eat fish, I swapped the smoked salmon sandwich for an extra coronation chicken slice which was the BEST IDEA EVER. Of the four sandwiches on offer, the coronation chicken was without a doubt the winner and I’m dribbling a bit just thinking about it.. There was not a single cake on this plate that I didn’t enjoy (and I STILL say that I don’t have a sweet tooth – maybe I need to reevaluate that). Malabar Marshellow – while an unusual addition in an afternoon tea, these were amazing. Amy and I actually ordered another 8 of the marshmellows to nibble on while we continued chatting – they were so addictive! Blueberry and vanilla choux – the blueberry was a gorgeous twist on a normal choux pastry, I loved it. Strawberry tart – a great classic and cutely presented with a little flower decoration. Apricot and rosemary cheesecake – this cheesecake was served in a mousse format and was probably my least favourite of the bunch but still blimmin’ lovely! Chocolate caramel gateaux – Chocolate is without a doubt, my biggest weak spot, so I absolutely loved this. Despite being so rich in flavour, the cake itself was really light, which is perfect when there are so many other cakes to try! While forks deep in the petits gateux, a waitress came and asked which cake we would like from the trolley – more cake?! The choice was between Victoria sandwich and a pistachio cherry cake. We all opted for the classic Victoria sandwich and it was gorgeous! Another choice was upon us before we knew it – plain or fruit scones. I love scones but was so full by this point that I didn’t even touch it – but the girls looked like they enjoyed theirs! After stuffing our faces, chatting the time away and snapping photos at every possible opportunity, it was time to pay up and leave. 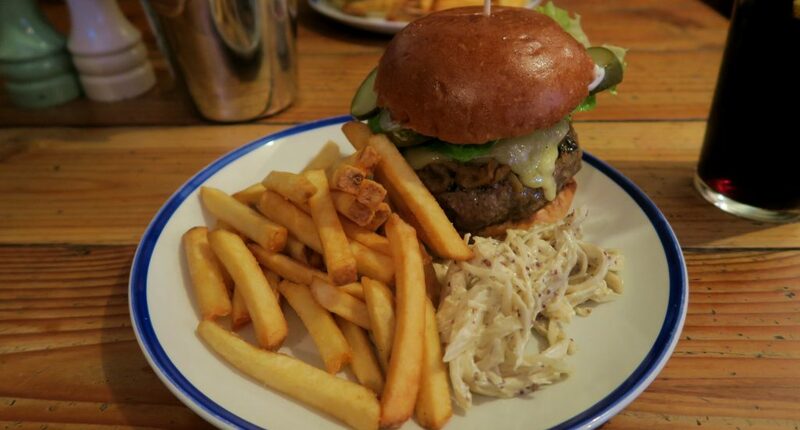 While bookings are hard to get on weekends, we were never rushed and could have stayed longer – which is great. The classic afternoon tea is £57 per person and to add one glass of champagne, the price is upped to £72. We stuck to the classic afternoon tea and didn’t think that £15 was a worthwhile investment for one glass of champers! The afternoon tea includes unlimited food which sounds great but given the amount of food on offer, you probably won’t need to ask for seconds! 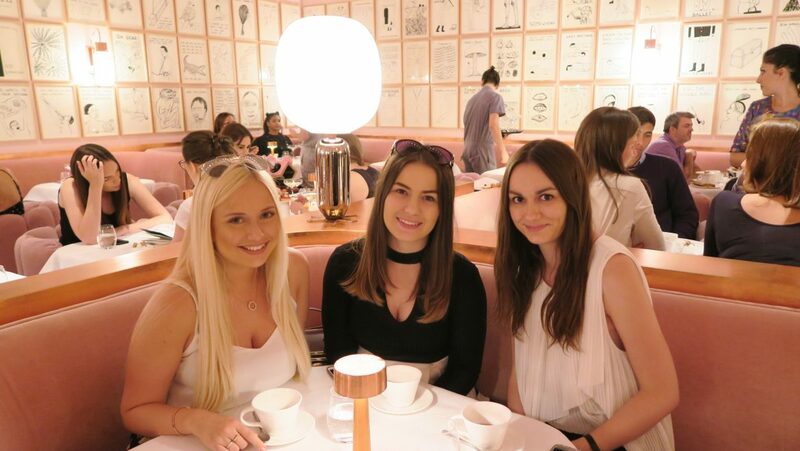 While the price is higher than other afternoon teas in London (for example, I recently went to the Charlie and The Chocolate Factory afternoon tea which was great), you’re paying for this beautiful venue and the 2 Michelin star dining experience which in my eyes, was well worth the money. 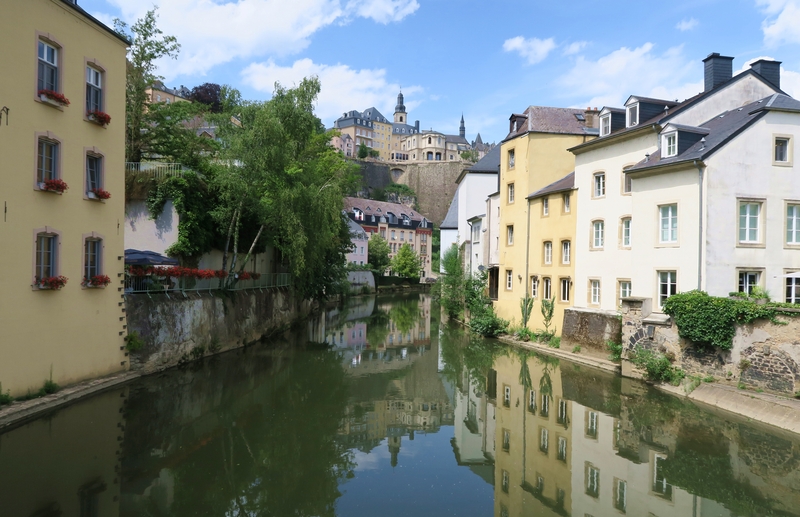 Our trip to Luxembourg was filled with sunny weather and long relaxing days, one of which took place in the Moselle Valley region of the country. 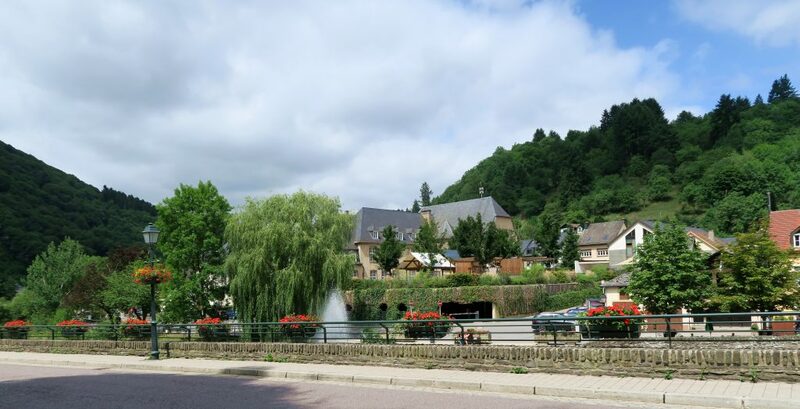 We were stuck for ideas for the last day of our trip (we had already decided to dedicate the other two days to Luxembourg City and Vianden), but when colleague of mine suggested a day in the Moselle Valley region – I quickly fell in love with the idea after a quick google image search! 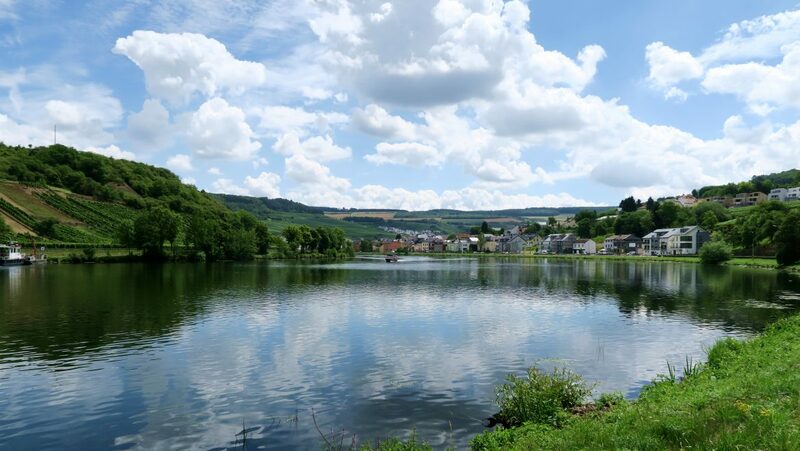 The Moselle Valley is a region in Eastern Luxembourg, North-Eastern France and South-Western Germany, so if you are crossing borders between these three countries and happen to do so through the Moselle Valley area, make sure you stop and explore! The area centres itself around the Moselle River and has jaw-dropping views no matter which way you turn. 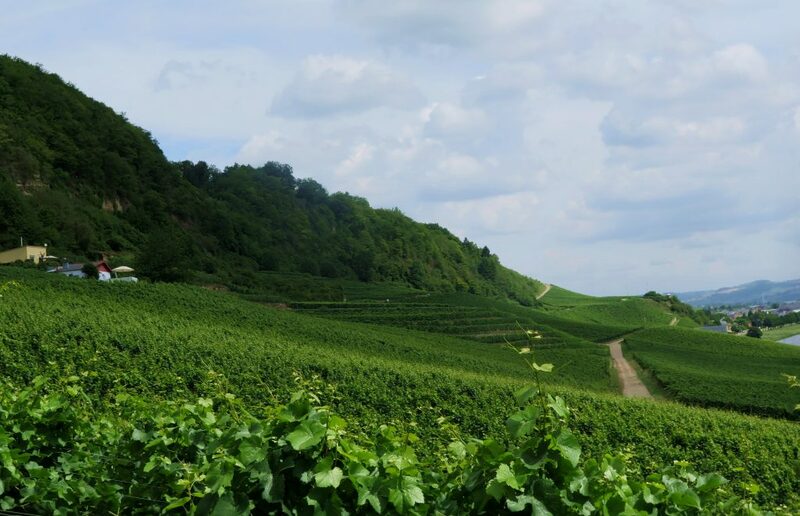 But alas, pretty views aren’t the only draw to this area – the Moselle Valley is also famed for being a producer of high-quality white and sparkling wines (yippee)! 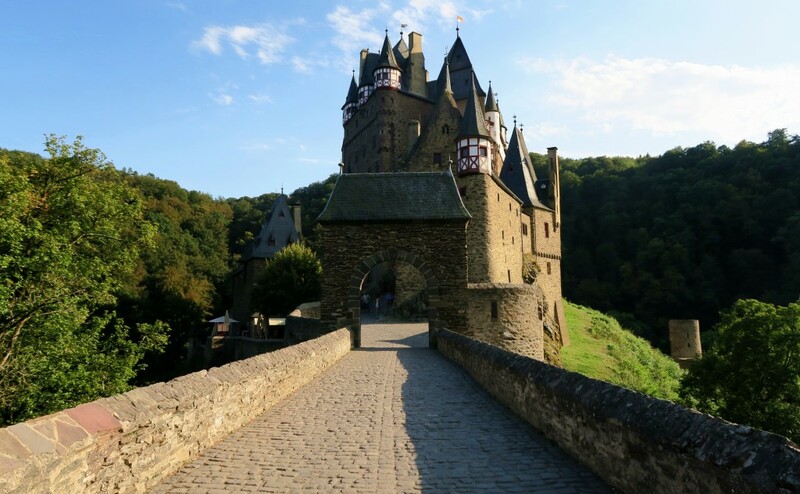 RELATED: I’ve visited the Moselle Area of Germany previously – have you read about my trip to Burg Eltz? It is the most beautiful castle! 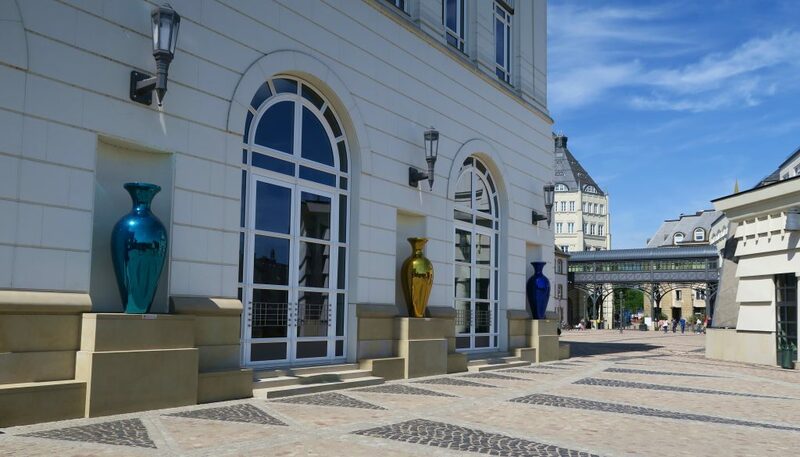 You can get to Grevenmacher using bus 130 from Centre Royal bus stop. The bus runs hourly and you can find timetables here. There are a few bus stops with “Grevenmacher” in the name, we hopped off at Grevenmacher Tanneurs and it was the perfect location. 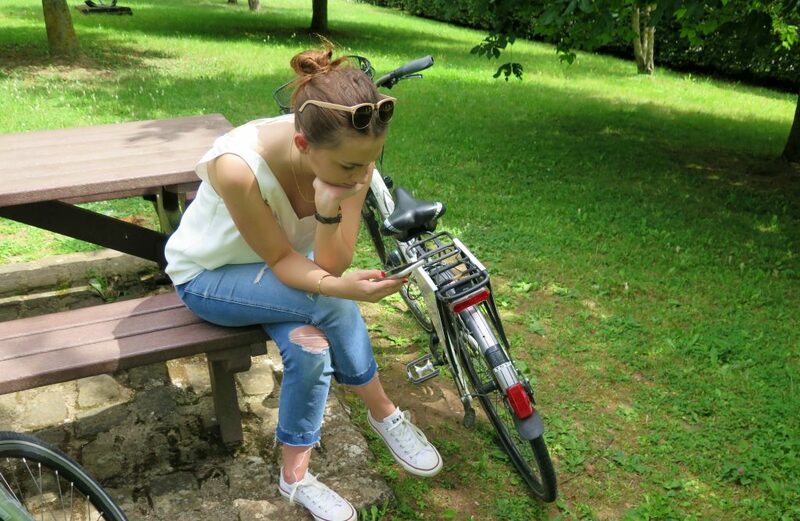 Using the Luxembourg Card, bike hire was free for up to 24 hours from a nearby campsite. The bikes were good quality and didn’t give me severe bum ache (I have been known to struggle walking after riding a bike before). 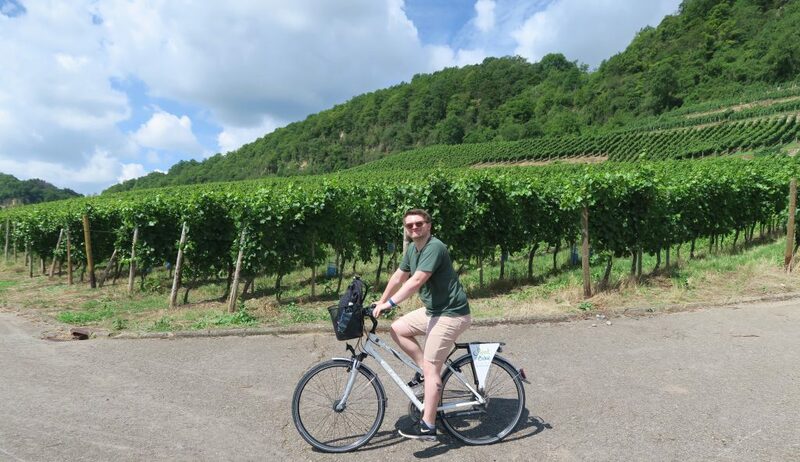 We planned to do the Circular Walk of Nature and Wine Discovery route but found out after a very steep hill climb that bikes weren’t allowed on a certain part of the trail and therefore stuck to the lower levels of the vineyards and the river front. As it was such a hot day and there was very little shade, being on the bikes was the perfect way to get around as it meant you got some breeze! We had a great time just cycling and exploring, this ended up being the majority of our day! With the sun shining, the river looked absolutely gorgeous and I couldn’t help but stop every few minutes to take a picture… or two… or three. 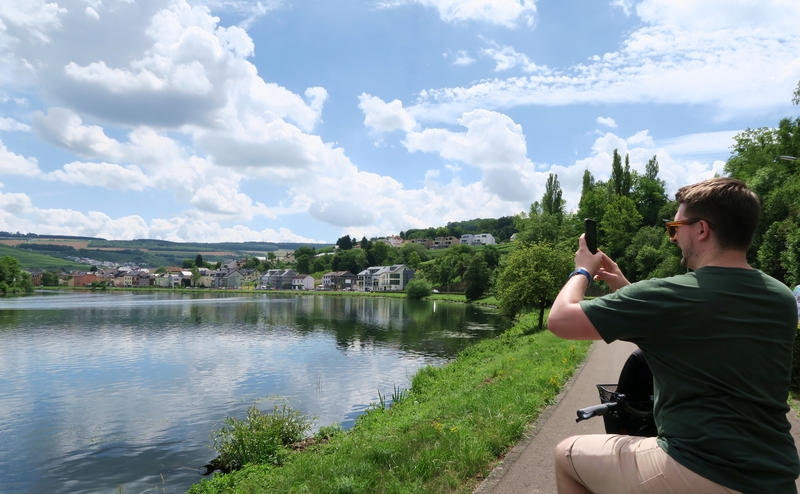 I remember thinking the river area of the Moselle was beautiful on our train ride through Germany last year to reach Burg Eltz, so to be able to stop and enjoy the views properly (i.e. not on a train) was great! On the hunt for lunch, we wandered into the town centre which is set back from the river and of course, as with the rest of Luxembourg,the buildings were gorgeous! 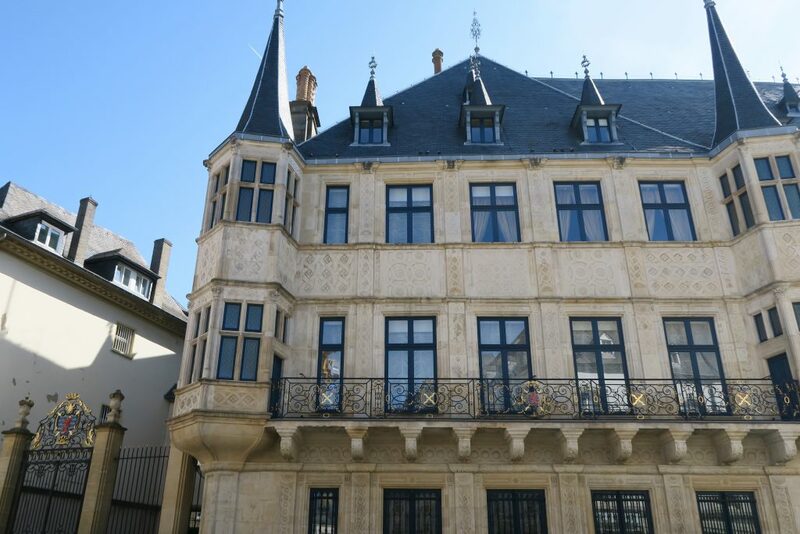 The buildings throughout the entirety of Luxembourg were really stunning, a true mix of old and new styles and everything looked immaculate at all times. 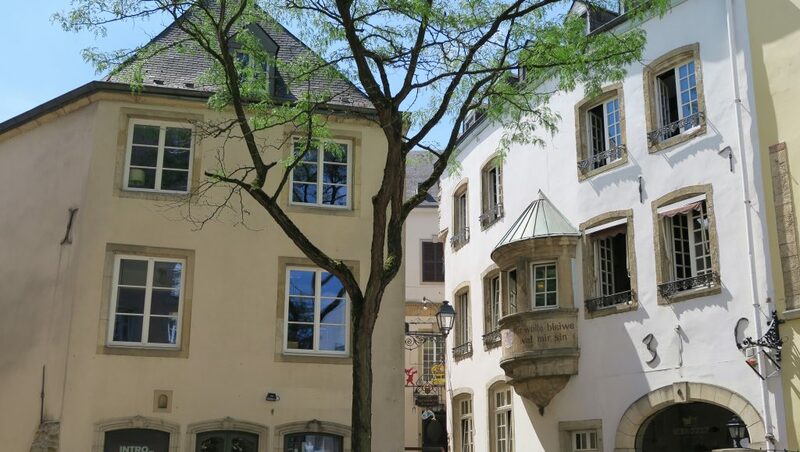 Luxembourg is a rich yet small country and this could be seen through the always prim and polished exteriors. 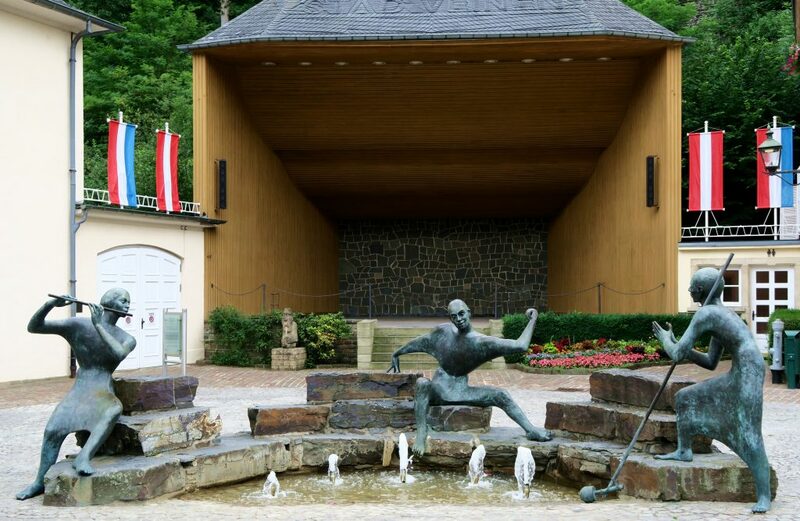 We made a slight error when planning our trip to Grevenmacher by visiting on a Monday. 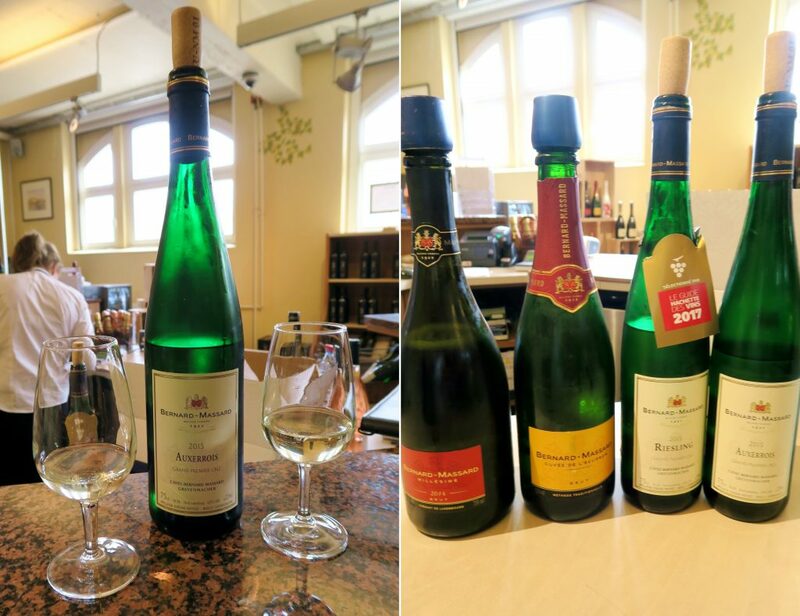 More careful research would have told us that Bernard Massard aren’t open on a Monday for vineyard tours and wine tasting (which is free with the Luxembourg Card). However, the extensive shop is open all days of the week and is definitely worth a visit! On explaining to the lovely shop assistant that we were hoping to to a wine tasting and vineyard tour, she gave us an explanation of the wines they have on offer and allowed us to taste a few! 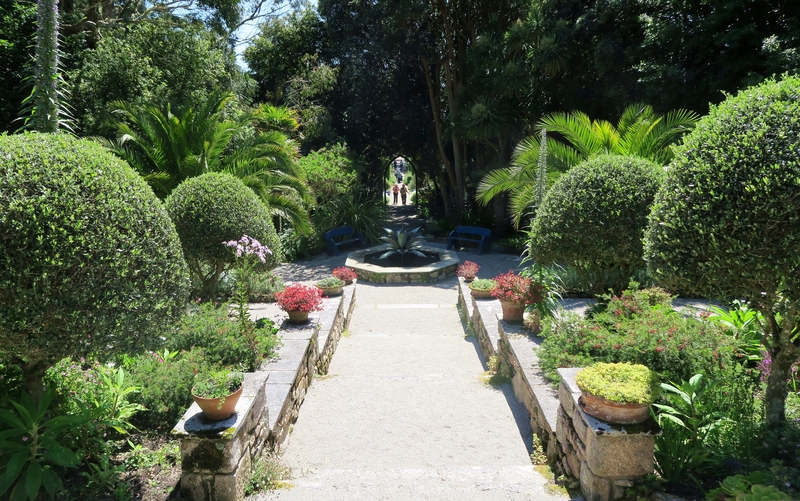 After returning the bikes to the campsite (side note: probably the nicest campsite I have ever seen), we went to the nearby butterfly garden before returning to the bus. 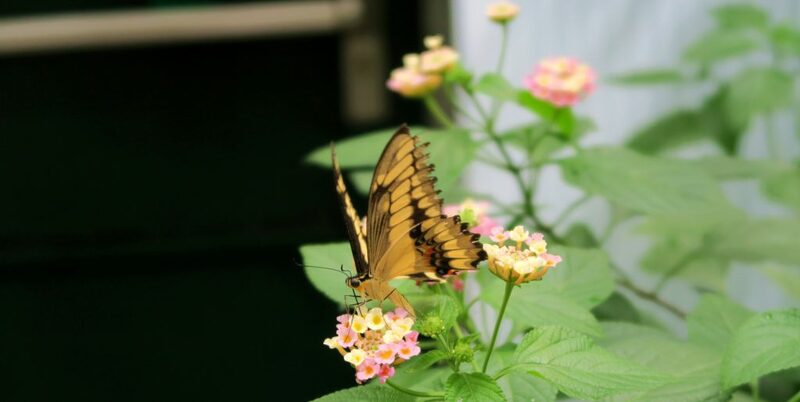 Butterflies have a significant meaning within my family, so I loved wandering around and snapping photos of the beautiful creatures. The Princess Marie-Astrid is a large boat on the river Moselle which offers a wide range of entertainment. From simply hopping on board to enjoy the scenery from the river, to entertaining themed nights and even a good old Sunday Lunch! The MS Princess Marie-Astrid is not open on Mondays, check here for timetables. 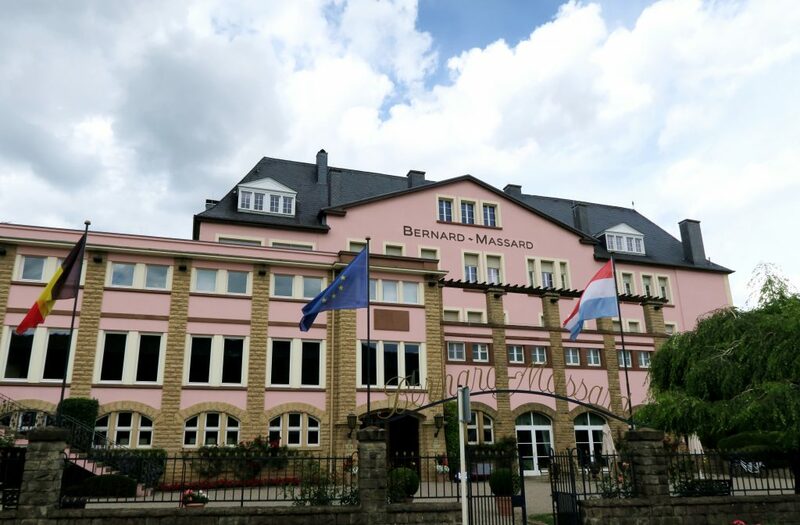 Also closed on a Monday (top tip – don’t visit Grevenmacher on a Monday!) is the Printing Museum which houses items dating from the 1930s used to make playing cards. Entry is free on the Luxembourg Card and the building looked small and worth a quick stop while you are passing by. 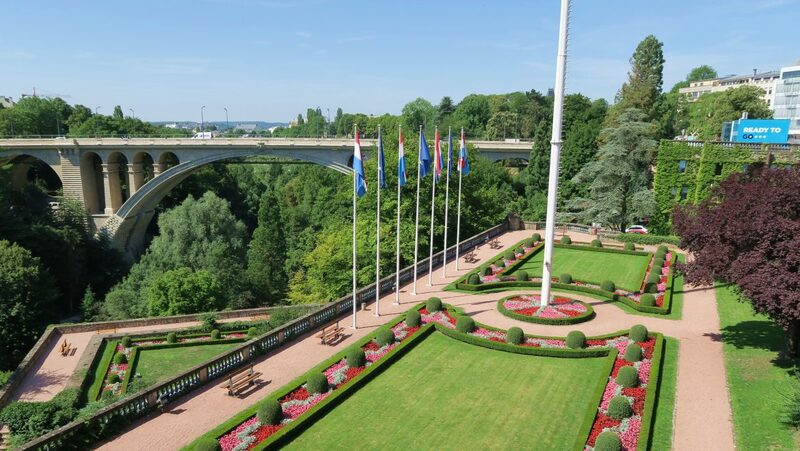 Are you planning a trip to Luxembourg? 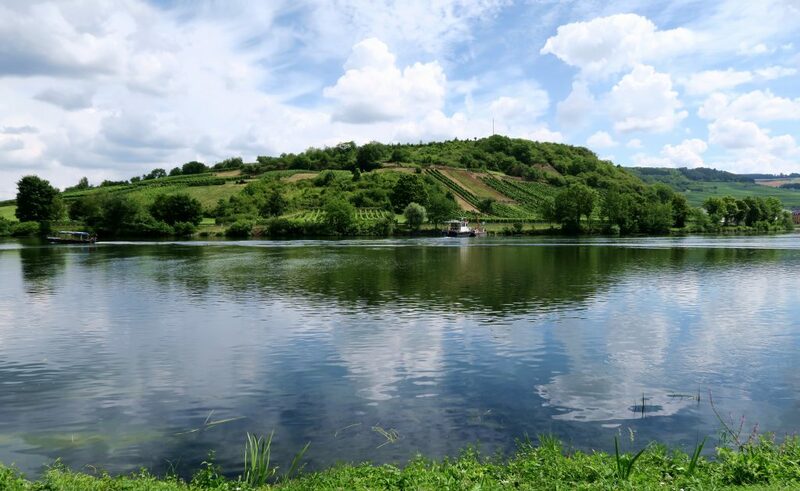 If so, be sure to add a day trip to the Moselle Valley! Disclaimer: In light of full disclosure, we did receive our Luxembourg Cards for free on behalf of the Luxembourg Tourism Board, however all thoughts are my own, as always. 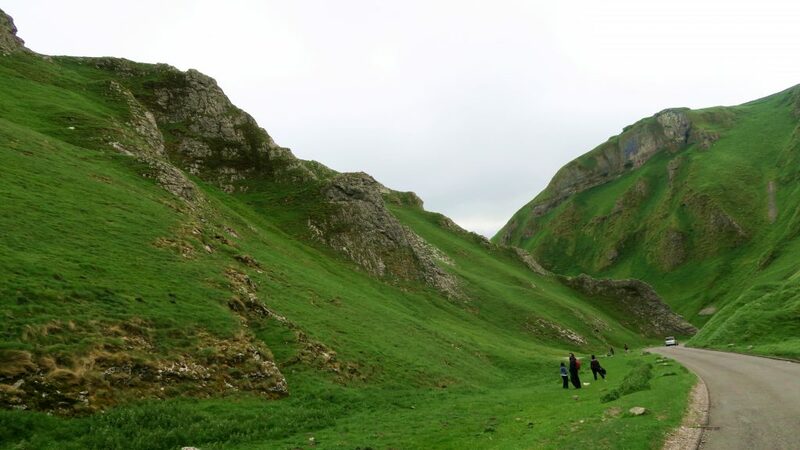 The Peak District is somewhere that I have ALWAYS wanted to visit (if you can’t tell from that happy face above). 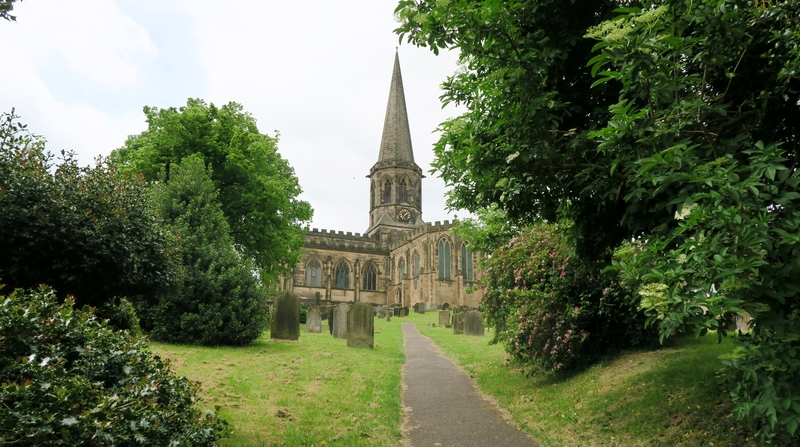 So when we were arranging to see my dad’s cousin in the Stockport area, I made sure that the Peak District was incorporated into our itinerary! 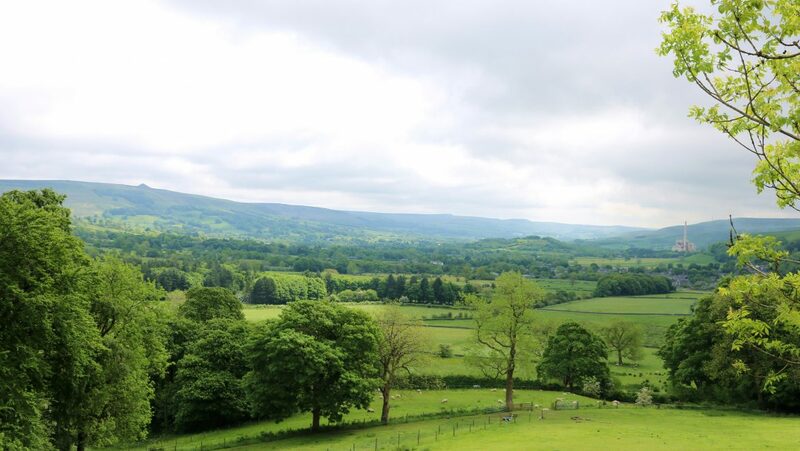 After spending Saturday with family at Tatton Park (Knutsford), we were ready to make the long drive home on Sunday with a detour through the Peak District. 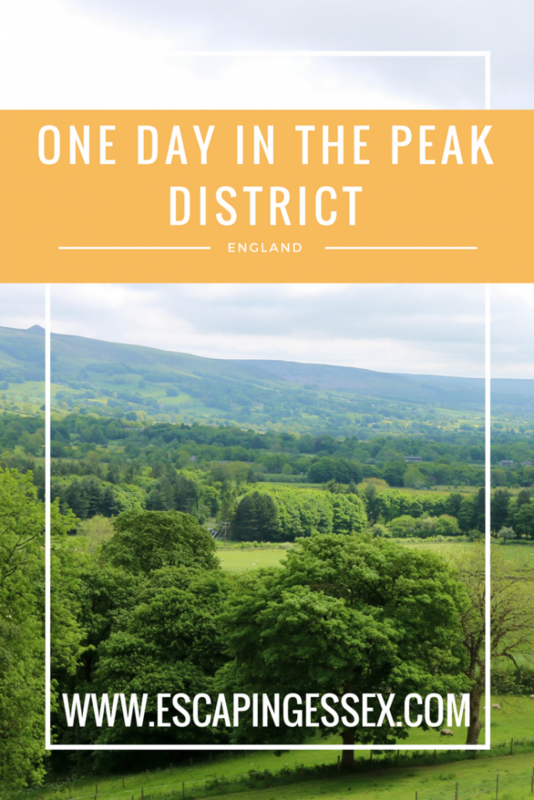 This was just a “taster” of the area and I REALLY want to go back, but if you only have a day, here’s what you can get up to in the Peak District! 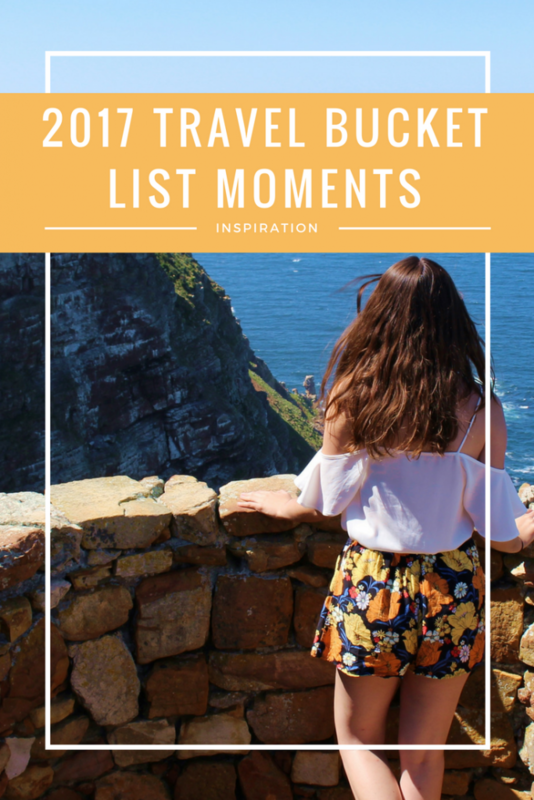 RELATED: The Peak District was actually on my list of places I am dying to visit in 2017 – find out where else I want to visit here! One of the best things that you can do is just drive (or walk if you have more time!). The area is so scenic that you are bound to stumble across some gems. This happened to us when stumbled across Winnatt’s Pass (thank you to Barefoot Backpacker for identifying my Instagram photo for me)! Next up, we were driving without real purpose towards Blue John Cavern (if you didn’t know, the Peak District is home to many really impressive networks of underground caves and caverns). After struggling to actually find the entrance and car parking areas being full (it was a sunny morning after all), we got highly distracted and just spent time at an incredible viewpoint that our Sat Nav had led us to on route! As an avid fan of Bakewell Tarts, the town of Bakewell has been on my radar for years but I’d never been. Although stories say that Bakewell Tarts don’t actually originate from Bakewell and instead the Bakewell Pudding is the local delicacy. Most shops sold both and of course we had to try both! 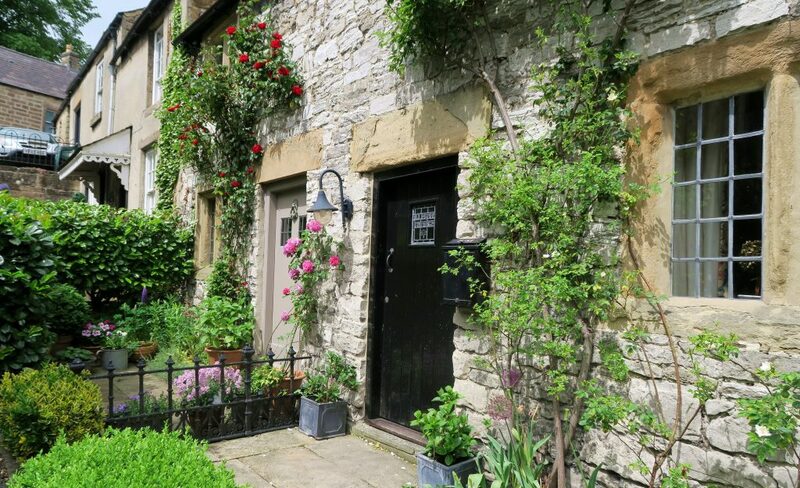 The town of Bakewell is truly picturesque and is definitely worth having a wander around. We first went for lunch in a cute little café, took a stroll around the main town, visited the beautiful church, went on a hunt for Bakewell and finished our time here by sitting in the sun at the edge of the river feeding the ducks. All in all, it was the perfect little stop-off! 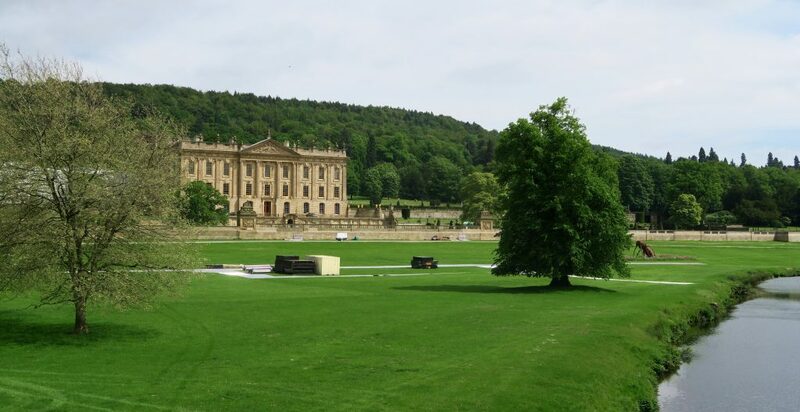 Chatsworth House is probably one of the more famous destinations in the Peak District and as you would expect, on this sunny day, the grounds and car park were absolutely heaving with people. We wanted to have a wander around the grounds and not necessarily the house (we had been warned that the house warrants around half a day to fully explore and we simply didn’t have the time). Given how busy it was, we snapped a few pictures and quickly left. But the house is really gorgeous and such an impressive building. 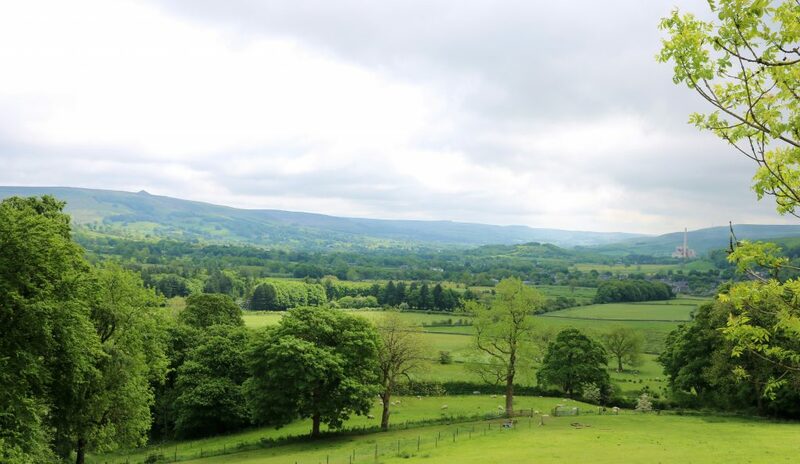 Next time I am in the Peak District and I have a bit more time on my hands, I will do a proper stop-off! After spotting signs for Haddon Hall near Chatsworth House, we decided to follow them, hoping that we would be able to do a similar quick stop off to admire the building before making the long journey home. Unfortunately, we had no such luck! It cost us £3 to park and with no view of the hall. 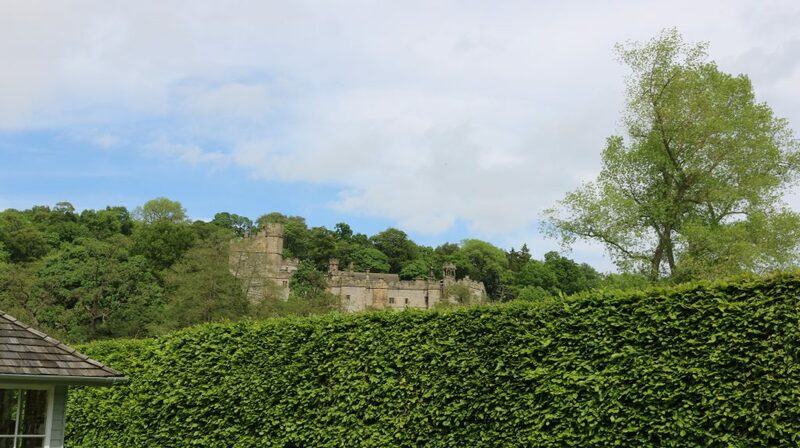 When we walked through to the “admissions area”, we could only see the very top of the hall over some high hedges and trees – with admission at a steep £14.50 per person and us being pushed for time, we decided to give this one a miss! 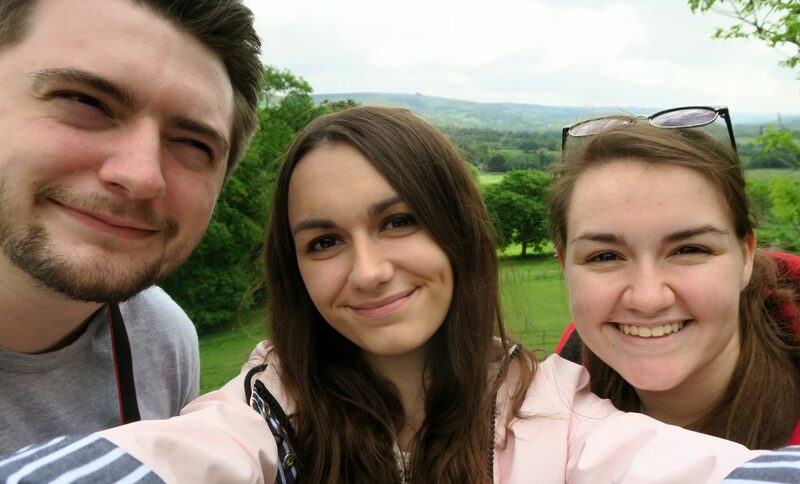 One thing we did learn was if you are looking to hit some of the main attractions in the Peak District, it can lead to being a very pricey day out (especially as there were 5 of us)! Everything has an admission price and a parking price – but never fear, the surroundings are so gorgeous that I would happily drive/walk around and not have to pay a penny! 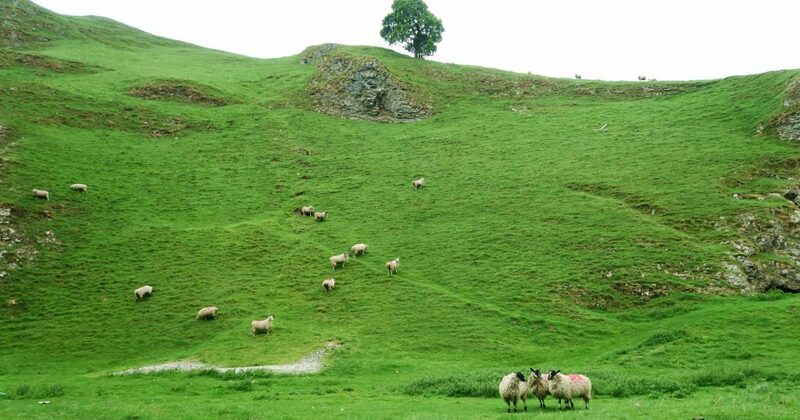 Have you ever been to the Peak District before? What was your favourite part? “How do you afford to always travel” is something I get asked by certain friends/family members of mine on a regular basis. Yet said individuals have been known to spend 2 weeks every year in an all-inclusive resort that costs around £1,500+ per person just for those two weeks which just isn’t my style! 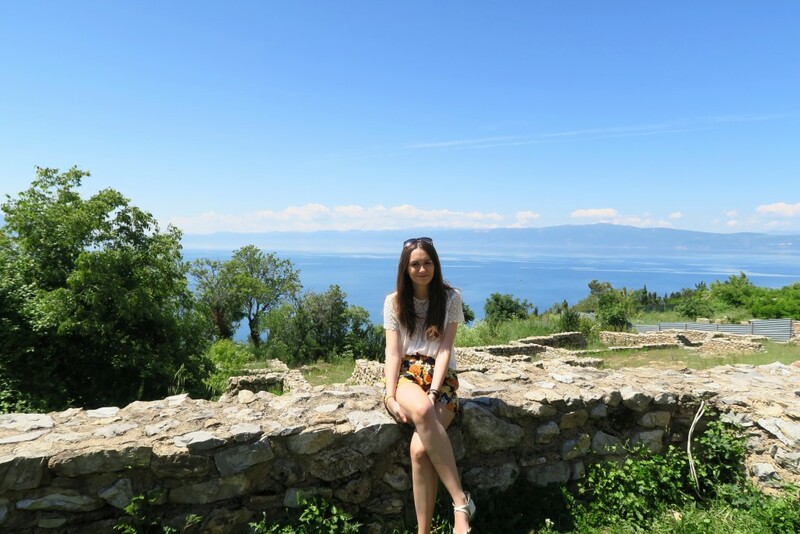 In 2016 I went on less European city breaks than I would have liked too – I had to spend too much annual leave on exams/study time unfortunately! I only managed 5 city breaks, but the total cost was £1,405.21 (average £281 per trip for flights, accommodation and spending money). When I’ve told people this, they’ve seemed shocked and confused – so I thought I’d set it all out in a blog post! £1,400 is still a lot of money, but in 2016 travelling was a priority for me and was worth every penny. I don’t spend money on clothes and accessories (although I definitely used to!) and that definitely helps to save. 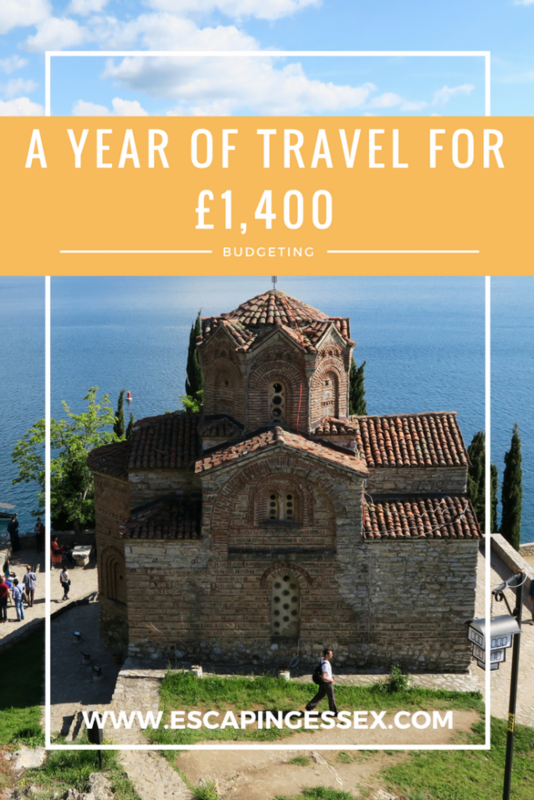 This £1,400 was spent over the course of a year, so if you want to experience the 5 city breaks listed above, you’d need to save £116 per month – given that my main blog audience are 18 – 25 year old females (much like myself), making the huge assumption that you are in a full time job without the responsibilities of kids or a mortgage, this could be entirely achievable depending on your priorities. 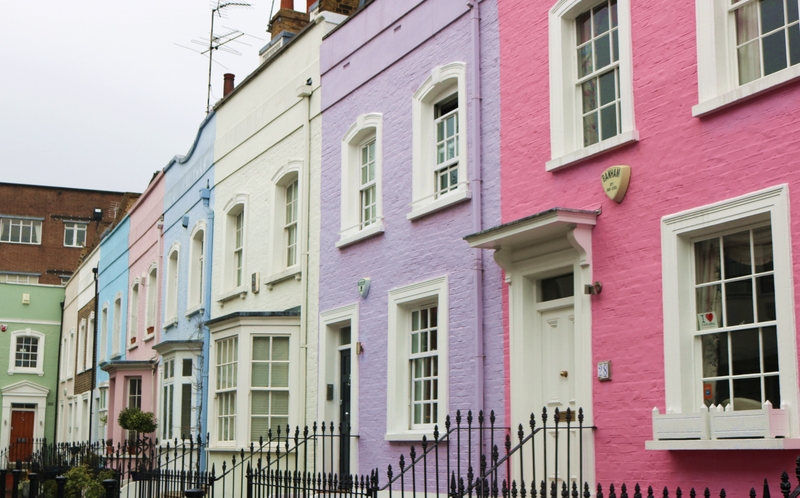 In 2017, I haven’t taken half as many trips as this but I’m currently saving every penny and thinking about getting on the housing ladder – priorities change and that’s okay! 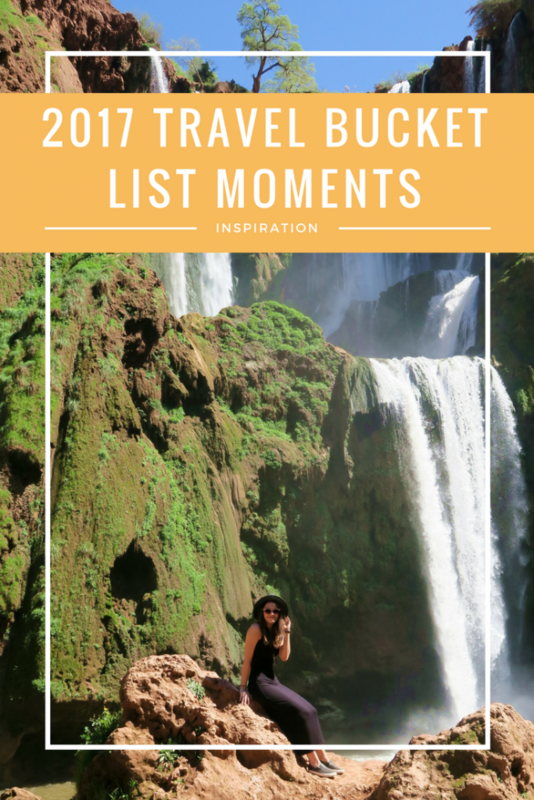 RELATED: Find out what I’ve given up in order to save money for travel here! I could have been FAR stingier with my spending on travel during this year. A prime example is my trip to Cologne. I was limited on annual leave by this point and had to utilise the August bank holiday weekend meaning flight costs rocketed. Our £60 return flights from London Stansted with RyanAir can be snagged for £18 most of the year (these seats are also always included in RyanAir‘s sales). And generally speaking, flying mid-week will be cheaper than utilising a long weekend (something I am a big fan of given my lack of annual leave), so if you work unusual hours, you could be quids-in! I have the Skyscanner widget on my Android phone homepage, so I am constantly able to see what the cheapest flights from London in the next month are. When Skysanner were advertising £25 flights to Ohrid (Macedonia), I knew that I HAD to have them. I hadn’t even heard of this city, but I know it’s not normally in the “cheap flight” category! After a quick google, I knew it was beautiful and I knew I had to go. 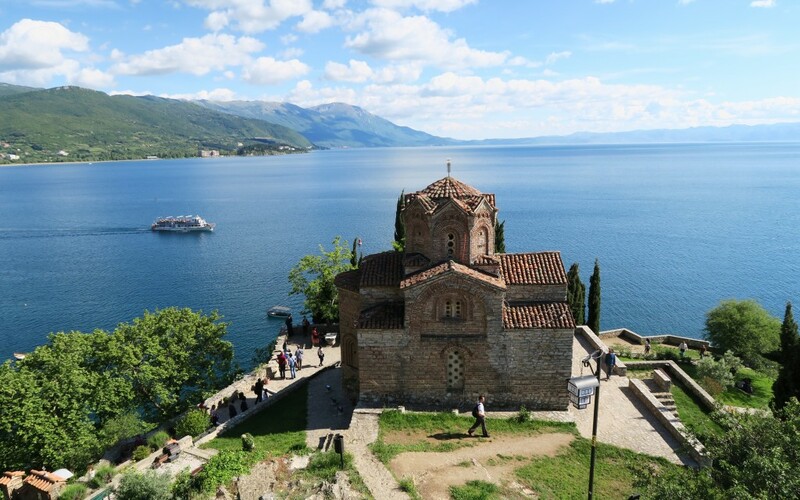 RELATED: Have you seen any cheap flights to Ohrid? If you manage to catch them, read all about my time there here! You won’t be disappointed! 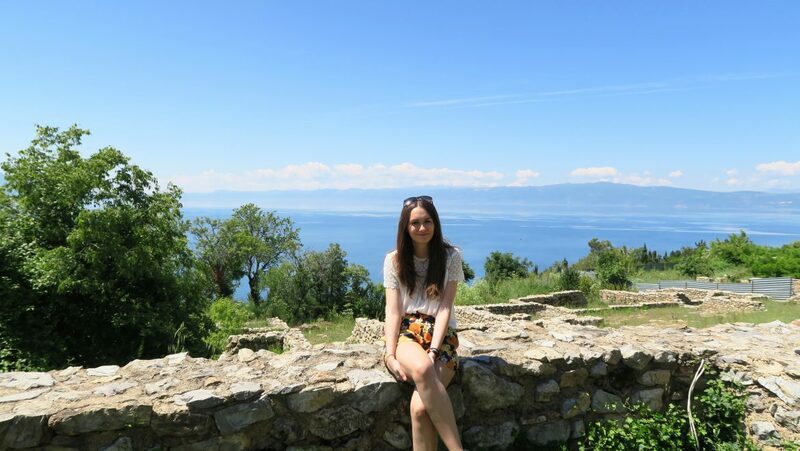 So above I mentioned that I saw £25 flights to Ohrid but I actually paid £50, what happened there?! Well, budget airlines have to make their money somehow and Wizz Air make you pay for normal sized cabin bags. Where possible, I fly with RyanAir who allow you to have one normal sized cabin bag and one small personal item (like a handbag, backpack or laptop bag) included in the price of your ticket! RELATED: Do you know what’s included in your ticket price? Read my guides for RyanAir and Wizz Air! How Could You Save More Money Than I Did? 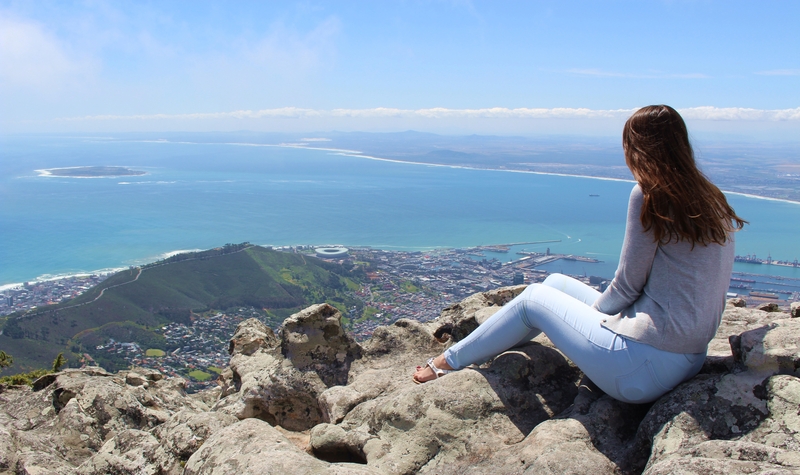 My biggest downfall when travelling in 2016 was having to make lots of little short breaks, this means that I was continually paying for return flights to the UK. I spent a total of 3 weeks in European cities during the year – so if you could get 3 continuous weeks off work and pick cities that are relatively close to one another, using public transport to get from one to the other will be much cheaper than continuously flying to and from the UK! Also, you’ll notice that my spending money in a city is normally on par with the flights and accommodation. This is because I like to FULLY immerse myself in a city and do absolutely everything that’s on offer. I rarely leave a city without having ticked off all of the “must see” tourist attractions. If you slow down and don’t feel the need to spend money on every single entrance fee, you will definitely save money. “Where?” people asked. “Is that the island off the coast of Italy?” others asked. 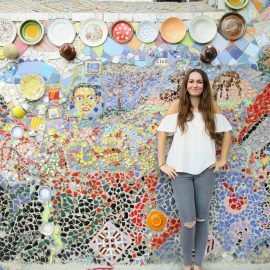 While a part of me wished that I was going to the gorgeous island of Sicily to soak up some Italian sunshine, I was going to somewhere just as beautiful! 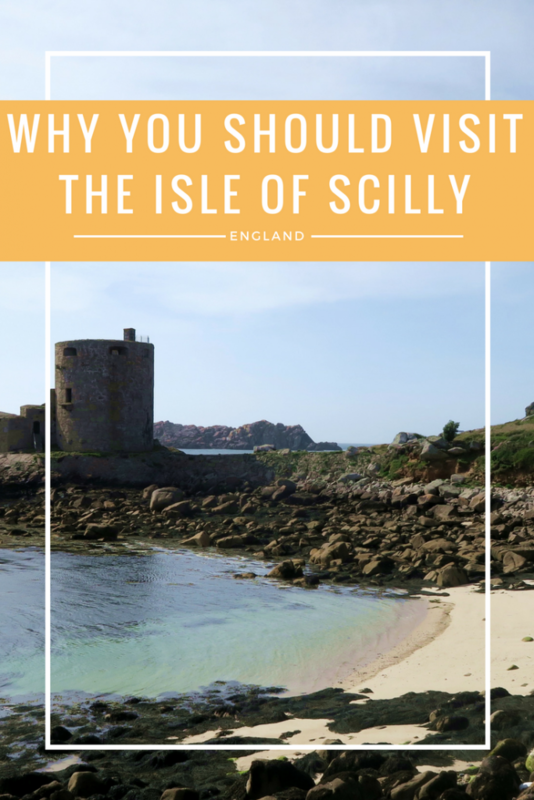 If you are still confused about where the blimmin’ hell I was heading, the Isles of Scilly are an archipelago off the coast of Cornwall. 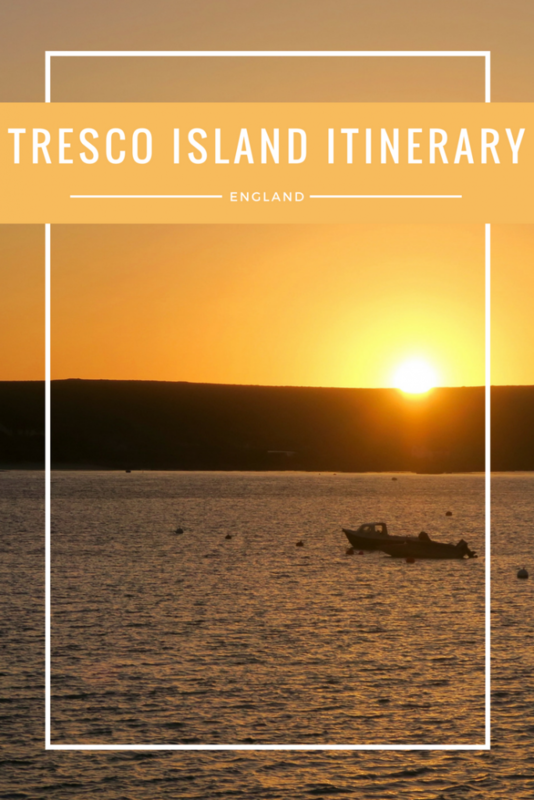 There are 5 inhabited islands that you can visit with ease but there are a whopping 140 uninhabited islands in the area too! You’d think that because you’re still technically in the UK, you’d be destined for gloomy, miserable weather no matter what time of year you go (apart from the unpredictable week of glorious sunshine we seem to get in Spring/Summer). But no, given the fact that the Isles are the most Southern point of the UK, their climate is surprisingly tropical! So, do you want crystal clear waters? 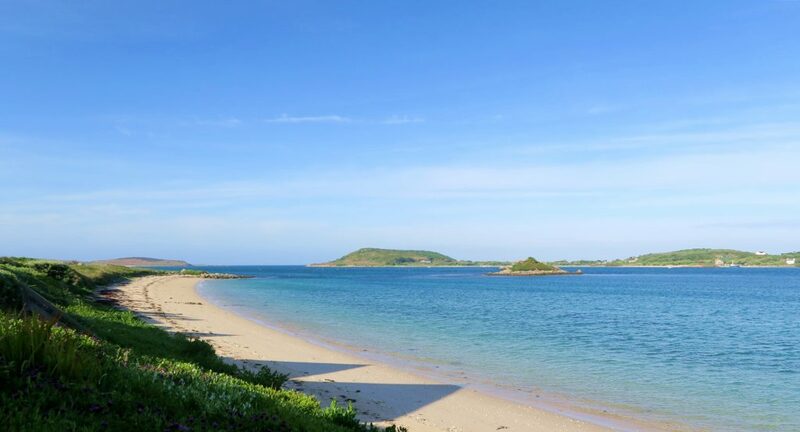 Forget Mexico, forget Bali, head to the Isles of Scilly. When I showed my Uncle some photos of the beach, his immediate reaction was “that is the kind of beach we were looking for when we booked our Mexico honeymoon”! There are hundreds of little beaches dotted around the Island. 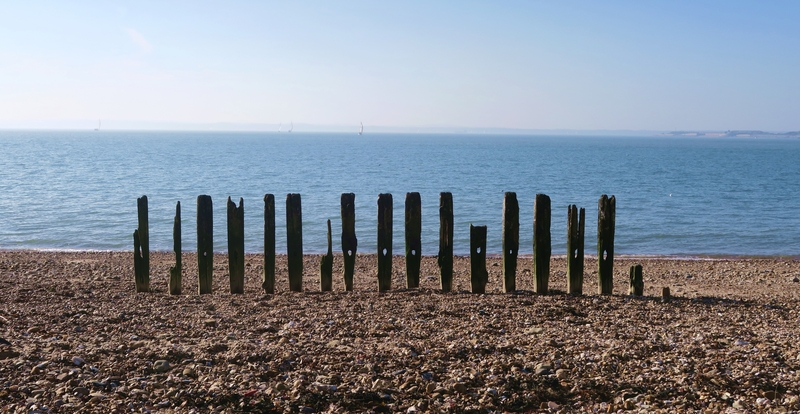 We visited in May and rarely saw other people on the beaches with us! 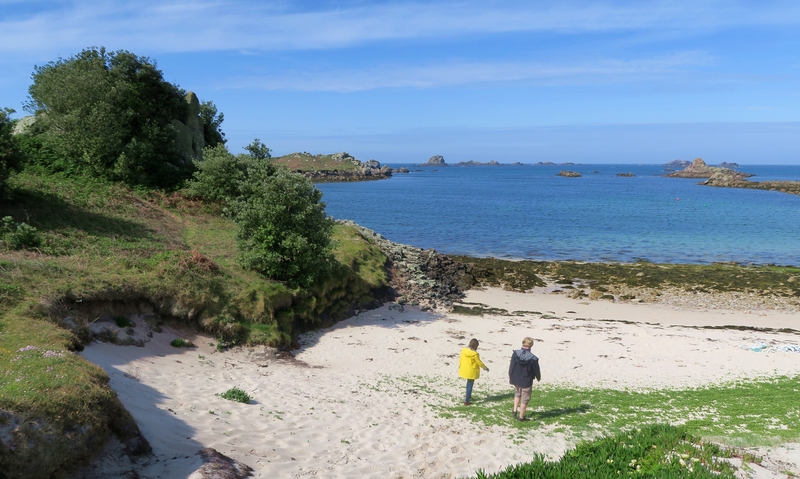 Unfortunately (despite my previous point), we did have some freak cold/rainy weather in May which meant the sea was absolutely freezing – but the beaches were still the perfect place to chill out and explore! Oh. My. God. This should be my first point really. The food on the Isles of Scilly is impeccable, no matter where you eat. 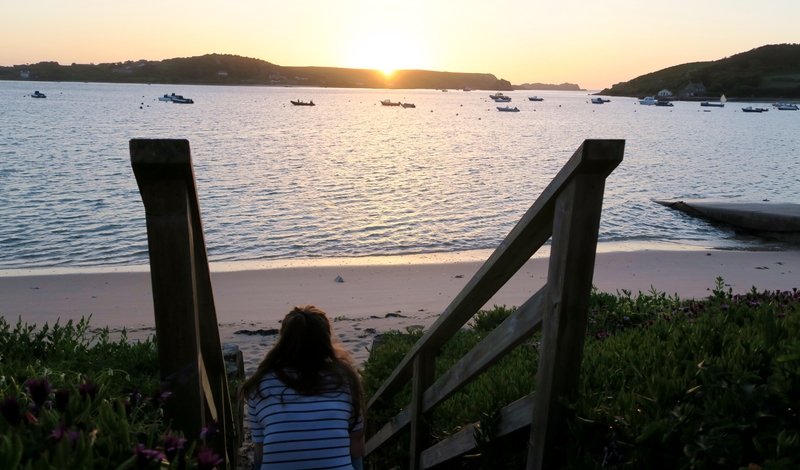 My personal favourite was brunch in The Flying Boat Bar & Bistro on Tresco Island (which was handily right outside our accommodation), I highly recommend! 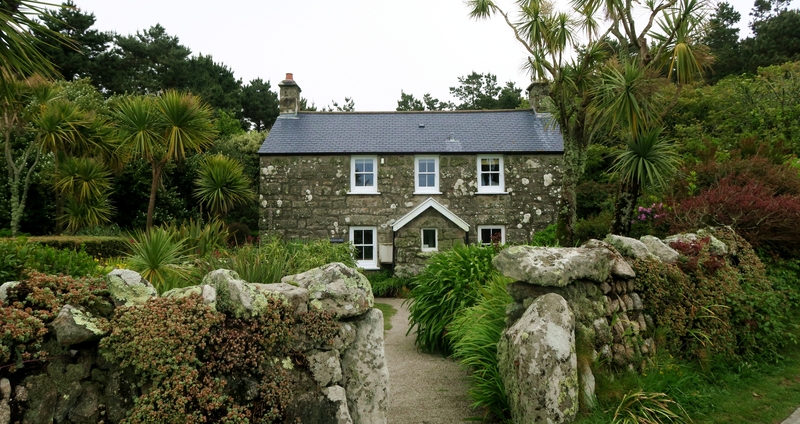 We stayed in the Friendship Cottage (one of the Flying Boat cottages) on Tresco Island and I only have good things to say about it. 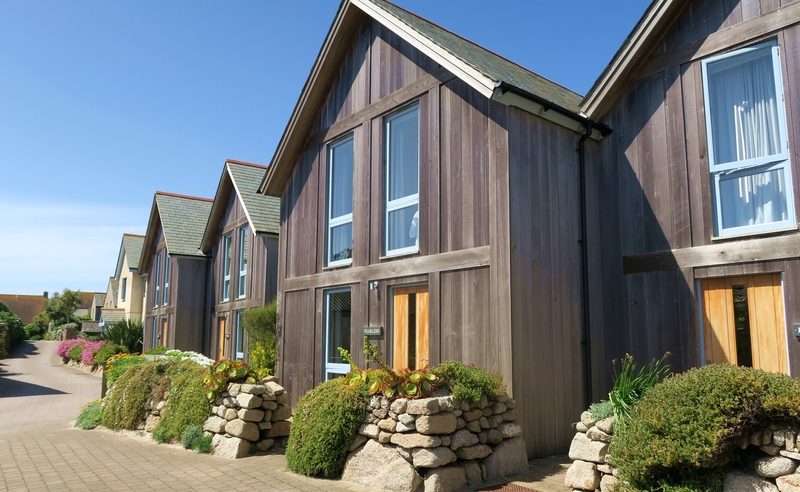 The cottage was spacious, well decorated, modern and had an impressive veranda area that led onto the beach. The master bedroom had huge double doors that opened onto a small balcony with a perfect view of the sea. There aren’t many better views you could wake up to (apart from maybe George Clooney, I don’t know). 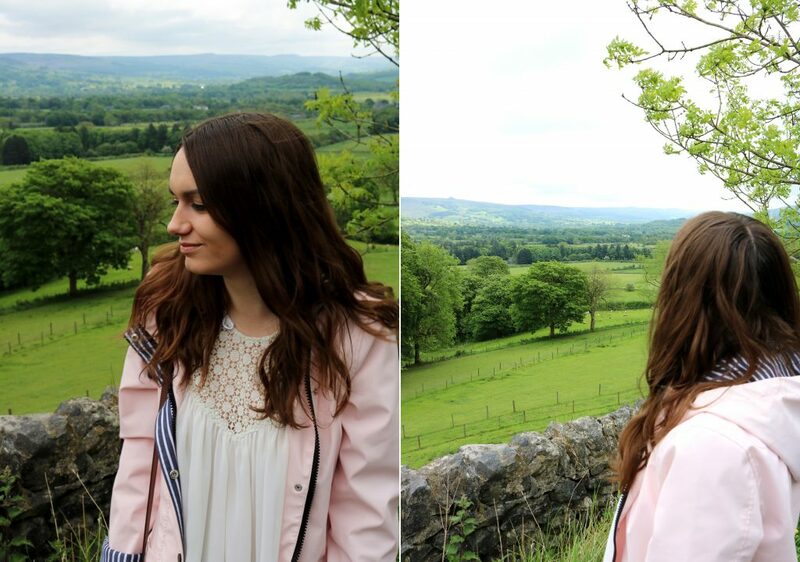 RELATED: I’ve been trying to explore more of England recently, see all of my posts on our glorious country here! Both in plant form and animal form, the wildlife on these Island will make you feel like you’ve to a tropical Caribbean Island. For plant-life, Tesco Abbey Gardens is where you need to be (and I’m not just bias because my friend works here).The gardens are really beautiful, especially on a sunny day and will make for the perfect afternoon of wandering. 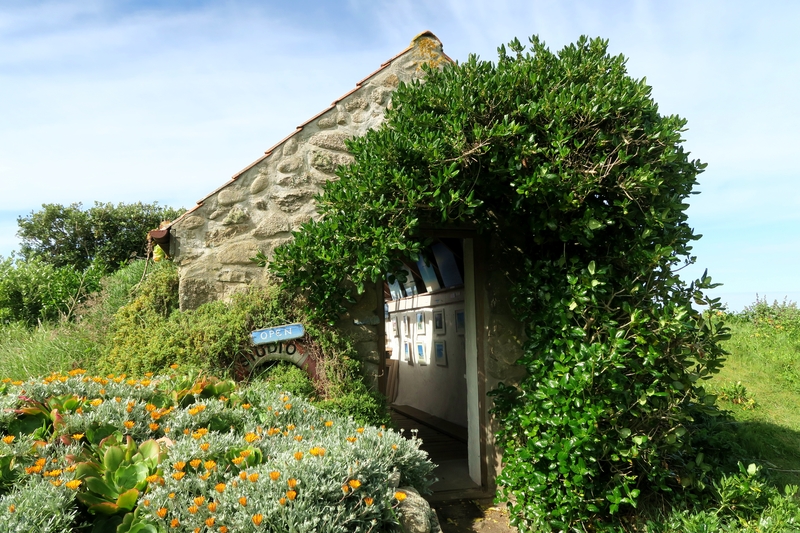 For animals, head to St Agnes Island where you will be able to take tours to (try!) 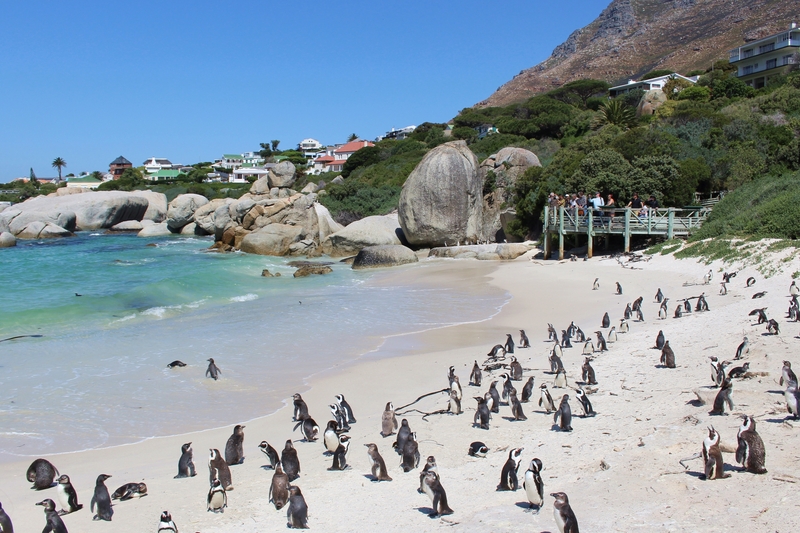 see seals as well as many different species of birds. We unfortunately didn’t have time to take this trip but we did spot the gorgeous Golden Pheasant! 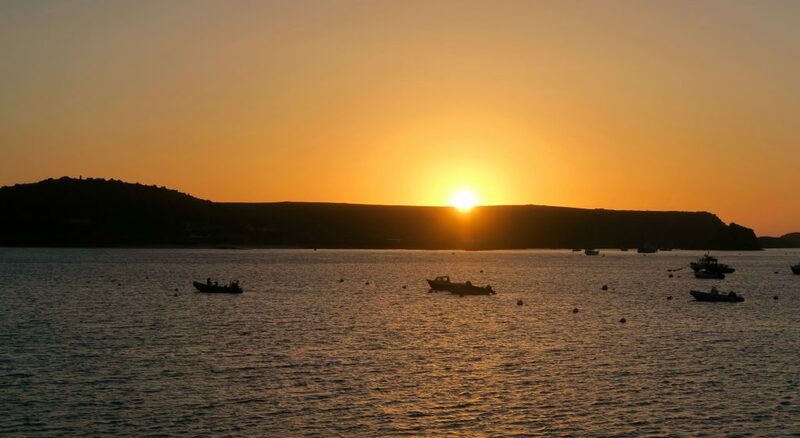 If you’re looking for a chilled, relaxing break, there isn’t a better place. If I were to summarise a perfect day on the Islands, it would be waking up to the view of the sea before having your morning cuppa on the beach. A long brunch is the best way to get your energy (especially with the Islands’ great food) before taking a long relaxing stroll across any of the Islands taking in the truly picturesque scenery. While there may not be many people living on the islands (a 2001 consensus shows that there were a mere 2,153 people living there), they have the best lifestyle. Everybody knows each other, everybody is friendly and the relaxing lifestyle works wonders. If there’s one thing that having a friend in living in the Isles of Scilly who regularly sends me pictures has taught me, it’s that the Isles of Scilly have the most impressive sunsets in the whole of the UK. No, I haven’t tried and tested this, but I am almost 100% sure that this is the case. So, if you’re ever considering a break in the UK, make sure you give the Isles of Scilly some thought, you won’t regret it. 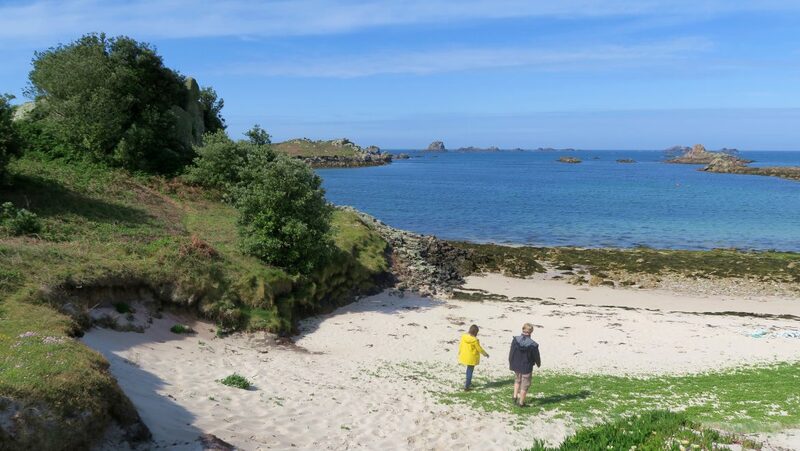 If you’re thinking of taking a trip, make sure you check out the Isles of Scilly Travel website for advice & bookings! 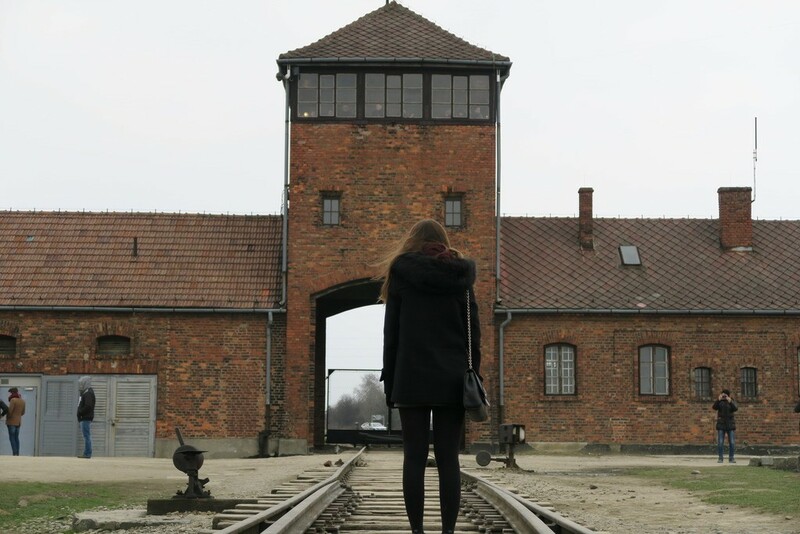 Have you ever been, what was your favourite part?